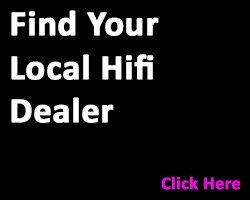 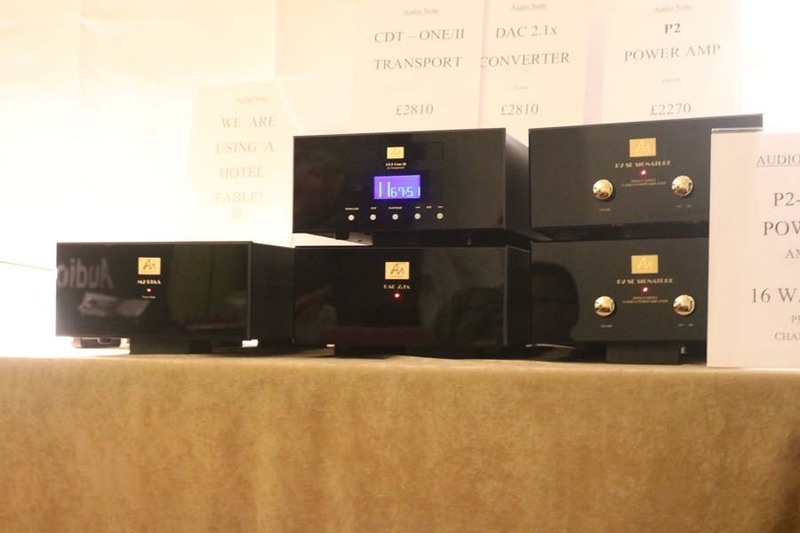 This year’s festival Of Sound took place in Hammersmith, London over the weekend and here is Hifi Pig’s first report from the show. 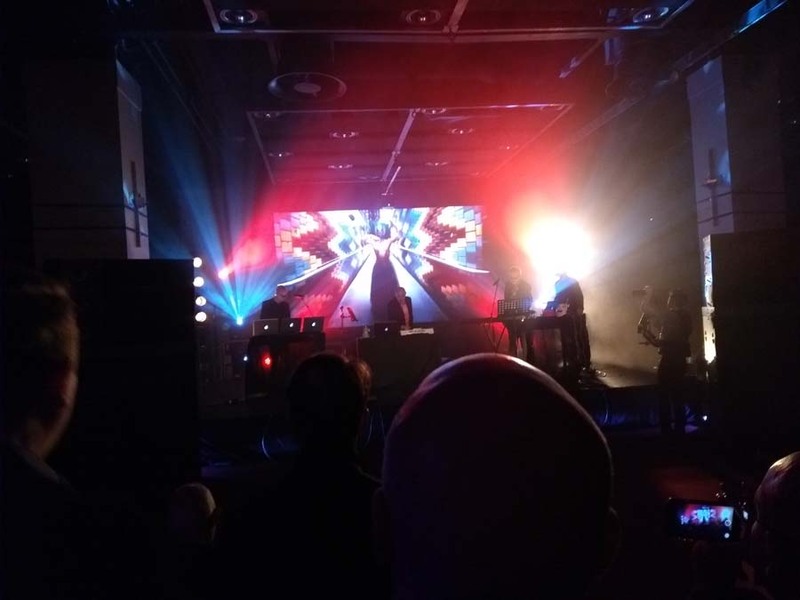 Due to the vagaries of Ryan Air and their apparent lack of interest in providing more than a piecemeal service from Brittany to London despite seats always being fully occupied, we arrived at the Festival Of Sound late on the Friday evening. 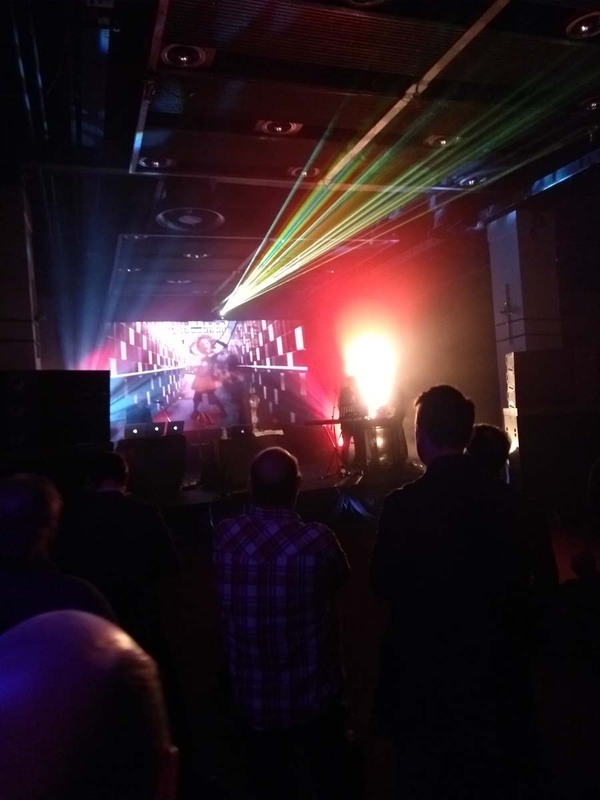 A quick change and we headed for the bar which was really buzzing with people from the industry. 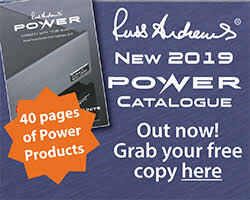 Having exited the lift we first bumped into the guys from Russ Andrews and Russ himself who said that whilst the first day of the show (it ran Friday through Sunday) hadn’t been hectic footfall-wise there were lots of people making purchases, which has to be a very positive sign; do exhibitors want hordes of people with empty pockets or fewer people who have cash to splash? 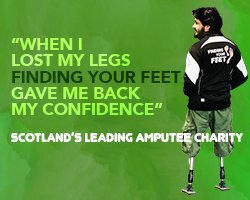 Speaking to others around the bar we were getting a similar kind of message with expectations for the coming days being high and everyone seemed to be very positive. 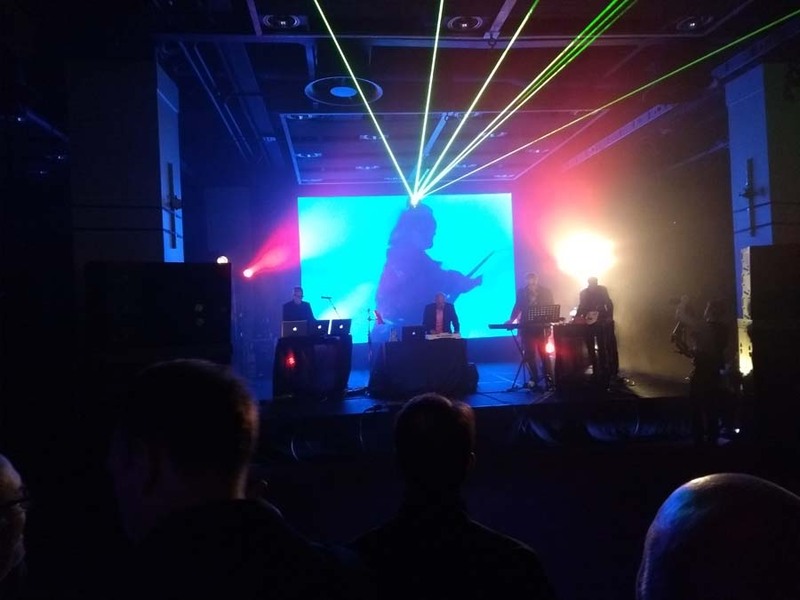 We had a prior dinner engagement with an old friend and so headed out but managed to get back in time to catch the last half hour or so of JJ Jeczalik and Gary Langan from Art Of Noise playing a stunning set with great video to boot. 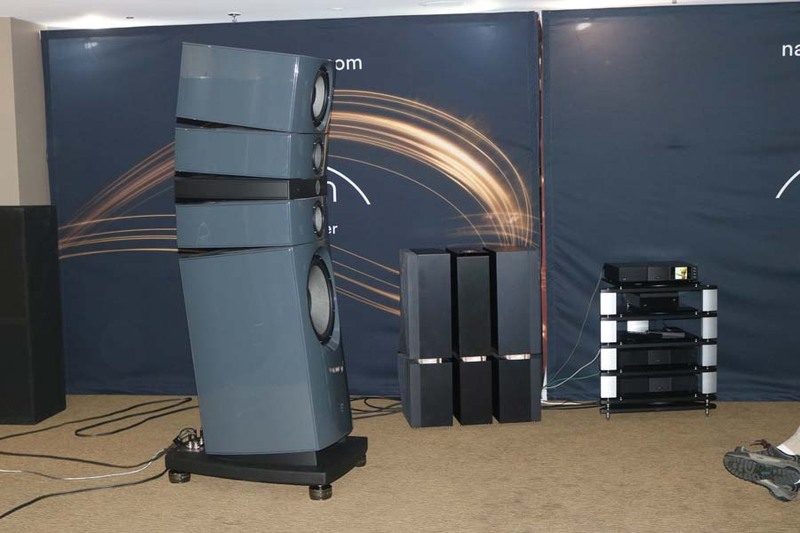 Now the system being used for the live music events had been provided by Bowers And Wilkins and is called simply Sound System. 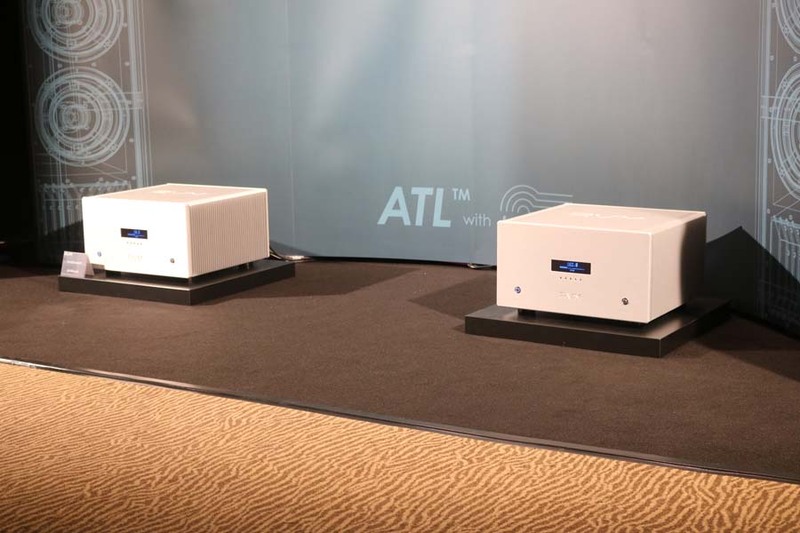 It has an impressive 32 bass drivers, 32 lower mid drivers, 16 mid drivers and 64 tweeters all powered by MC2 Audio amps which deliver an output of 120K watts. 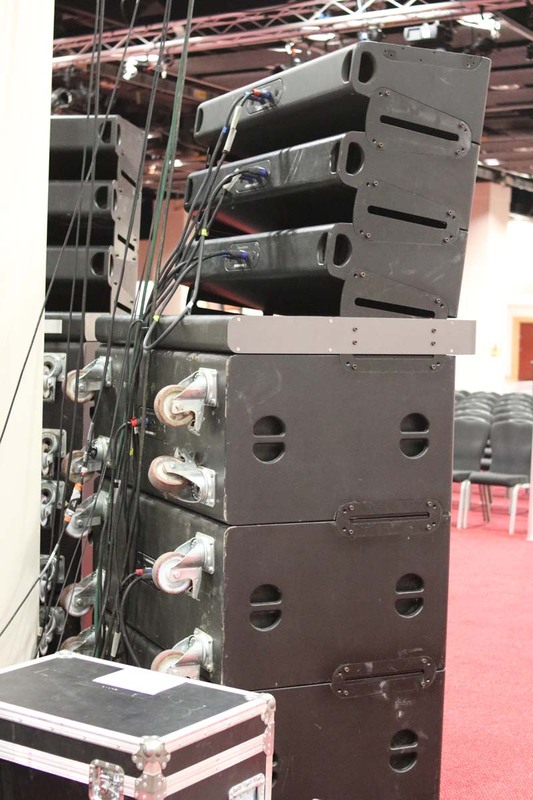 James Lavelle who had performed the night before described this system as one of the top five systems he has ever played on and given what I heard on the Friday night I can well believe it and I can honestly say that this was THE best PA system I have ever heard, with the electronic music playing tonight really showcasing what Sound System is capable of. 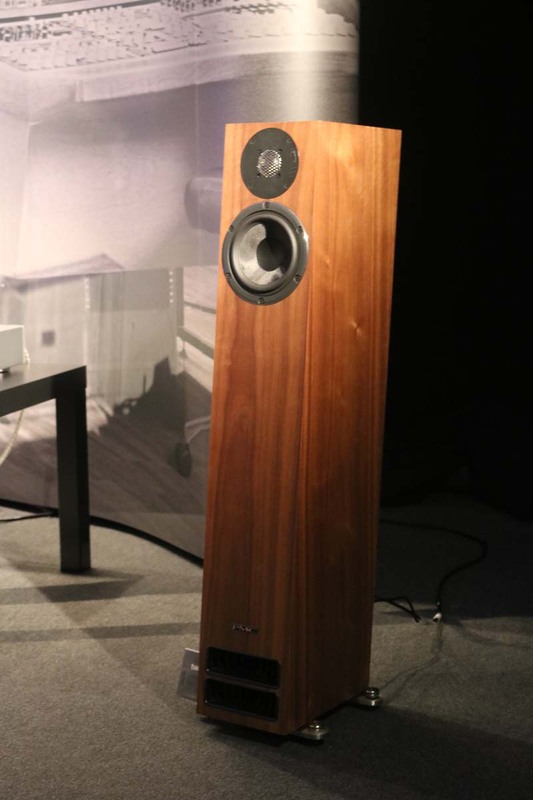 This was a proper live/HiFi experience done very well indeed and so hats off to Bowers and Wilkins for pulling this off so brilliantly. 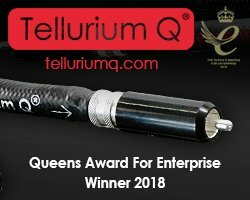 Usually I like to have a bit of a wander around a show the night before to get my bearings but alas this wasn’t possible but we did get up early on the Saturday to take a mosey round and there seemed to be good signposting. 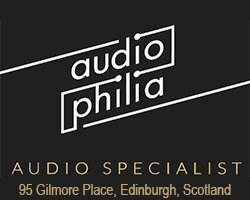 I also like to take a show-guide and plan who we need to see and where they will be and whilst the four-page guide was free to visitors it didn’t have room numbers or floors where different brands could be found and merely said “A Host Of Audio Exhibitors” which was a tad disappointing. 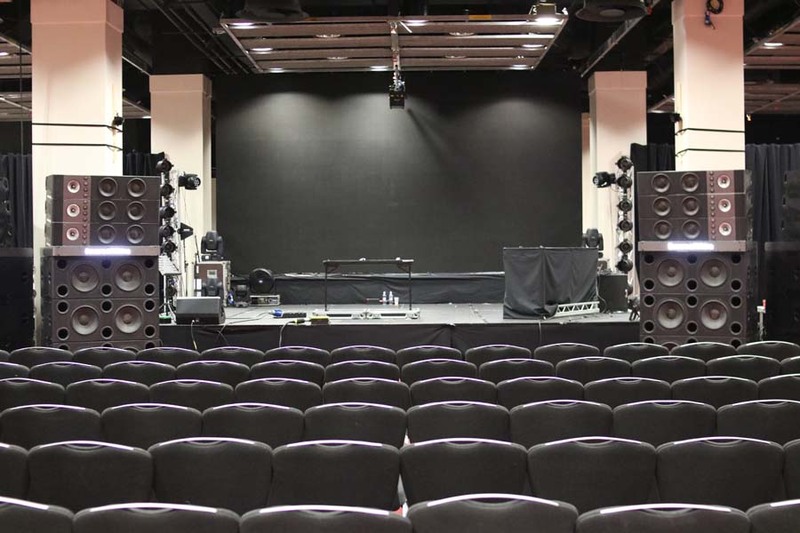 I guess the reason for this was organisers were selling rooms right up to the last minute but even a simply printed A4 sheet would have been very useful in helping us plan the day ahead. 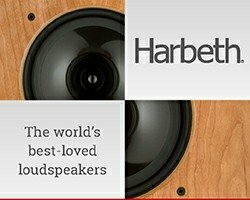 Perhaps a useful addition to the show in coming years would be a free app for visitors that could be updated in real time -something the North West Audio Show has used in the past. 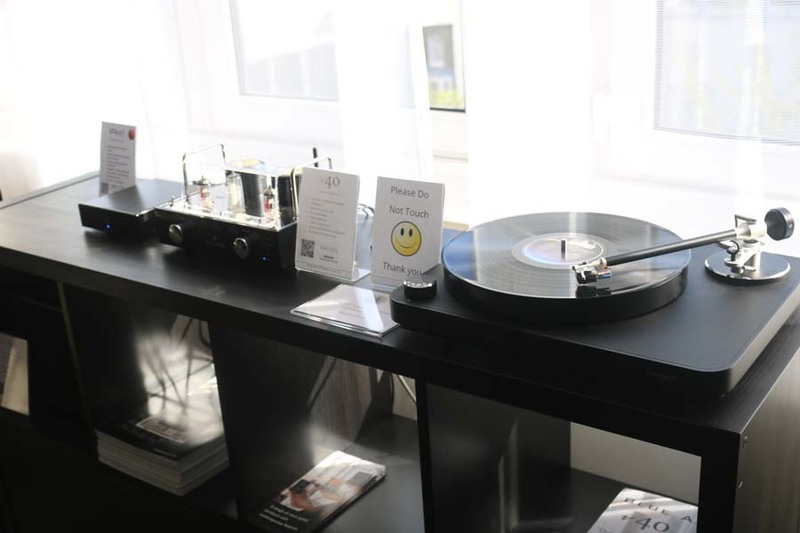 So, we always like to start at the top of the shop and work our way down to ground floor and we followed the same pattern at Festival Of Sound. 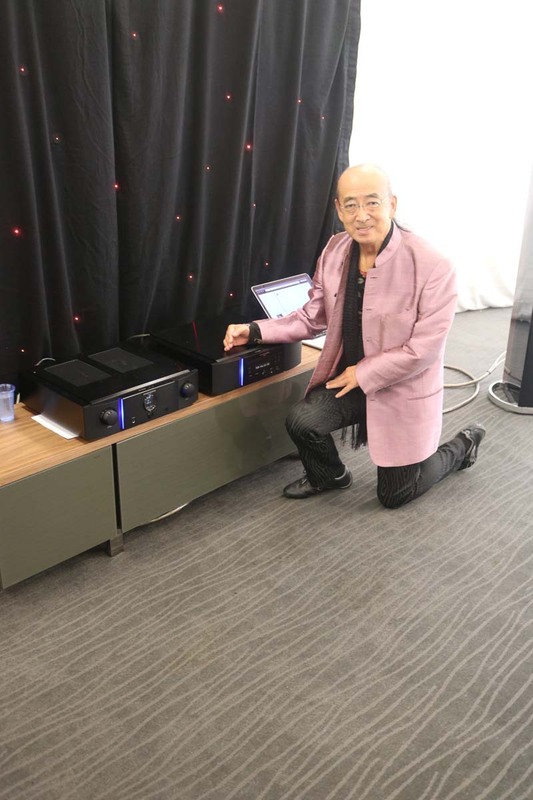 The first room we ventured into was Marantz hosted by the brand’s ambassador Ken Ishiwata who was absolutely charming. 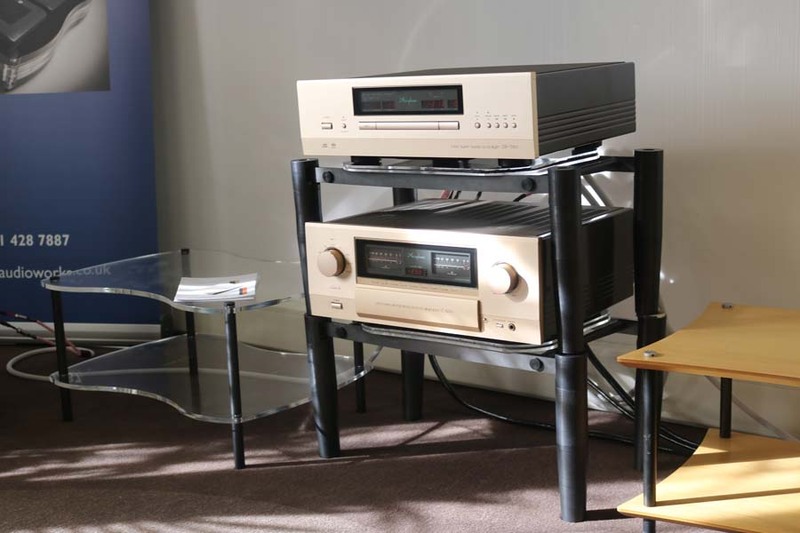 Kit was pretty minimal with just the K1 Ruby CD player and integrated amplifier feeding Q Acoustics loudspeakers. 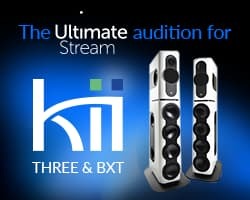 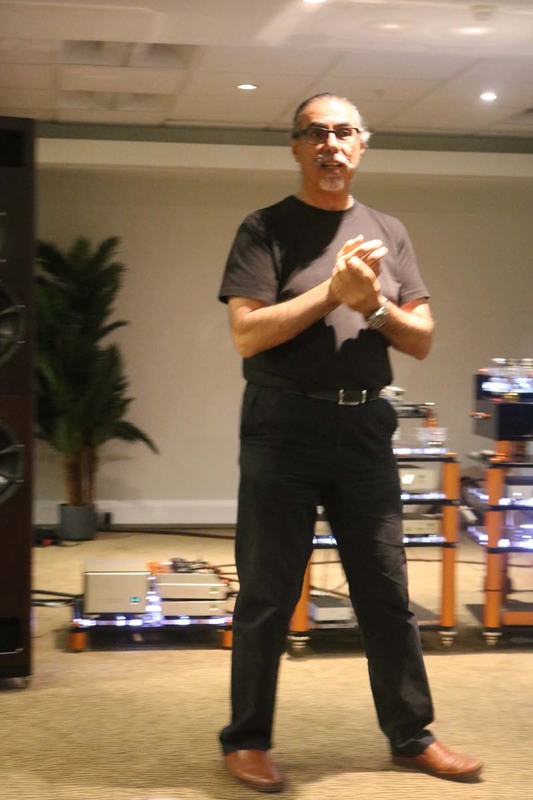 I asked why the speakers had such sever toe in and the answer was that Ken wanted to give as many people in the room a good idea of the soundstage etc and this was the best way to achieve this. 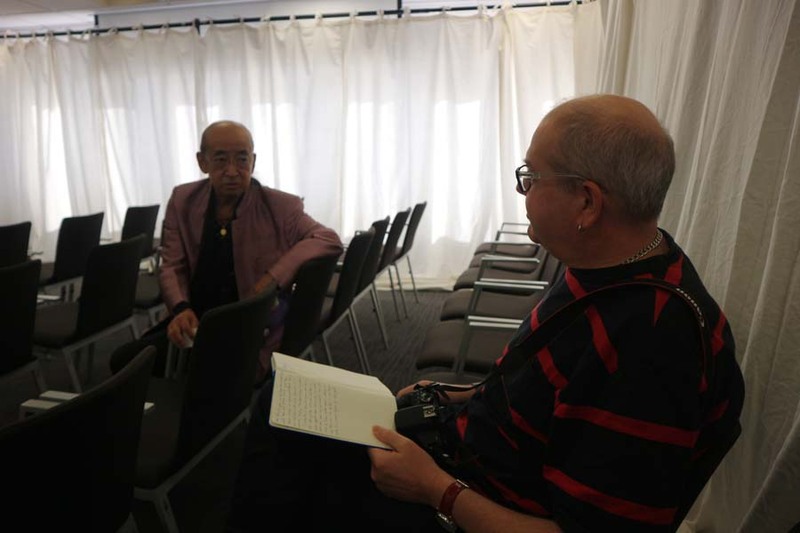 Other visitors in the room were asking questions f Ken and he was happy to answer them. 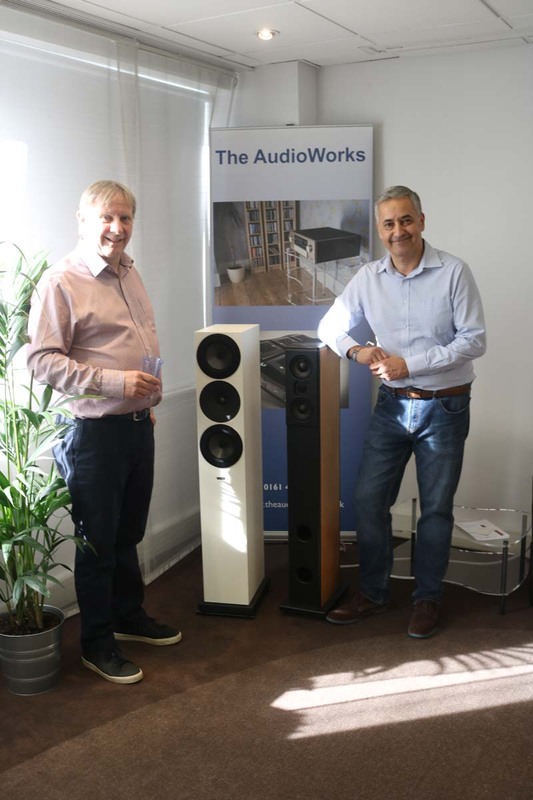 Next up was the Music Works and Auden Distribution room hosted by Bill and Larry. 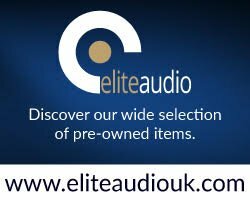 New to me were a brand from the States called Role Audio who produce a good number of speaker variants but today we had a pair of floor standers (Enterprise SE) and a small pair of standmounts (Discovery). 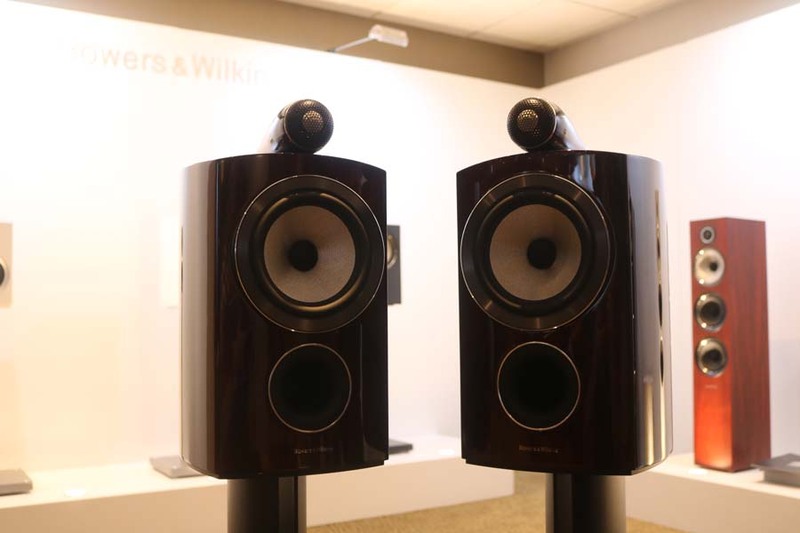 The bigger speakers use a 1st order crossover, aim to be time accurate and have a dual transmission line. 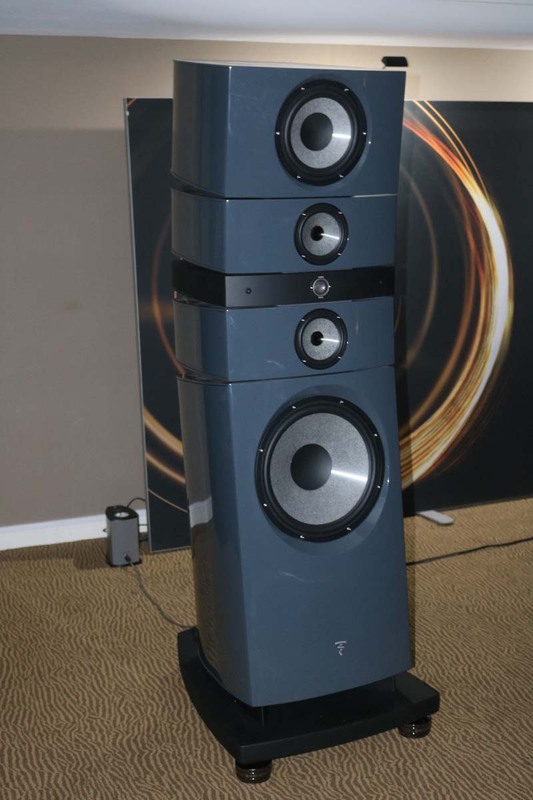 Prices are £4.5K for the floorstanders and £1300 for the standmountds.Electronics were by Accuphase with their new E650 Class-A integrated at £10.5K and the DP560 CD player at £9700. 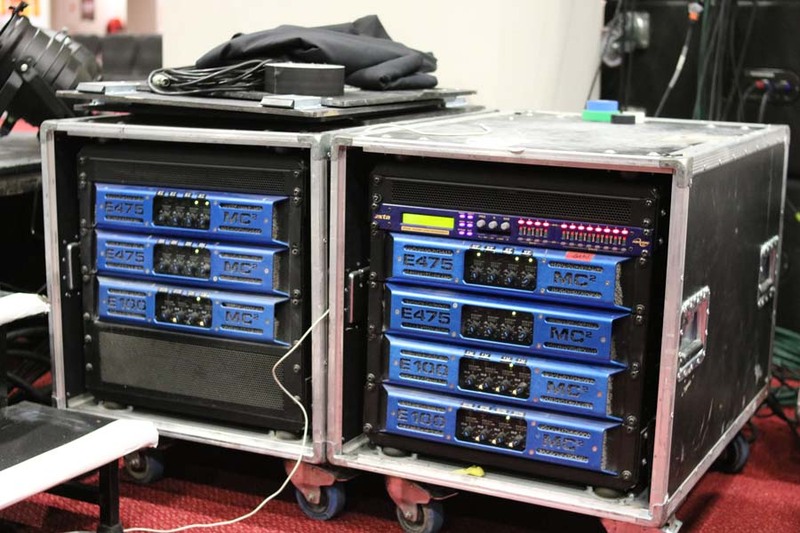 Music Works supplied all the cabling and rack and of particular interest was a “proof of concept” rack made of a plastic called PEEK. 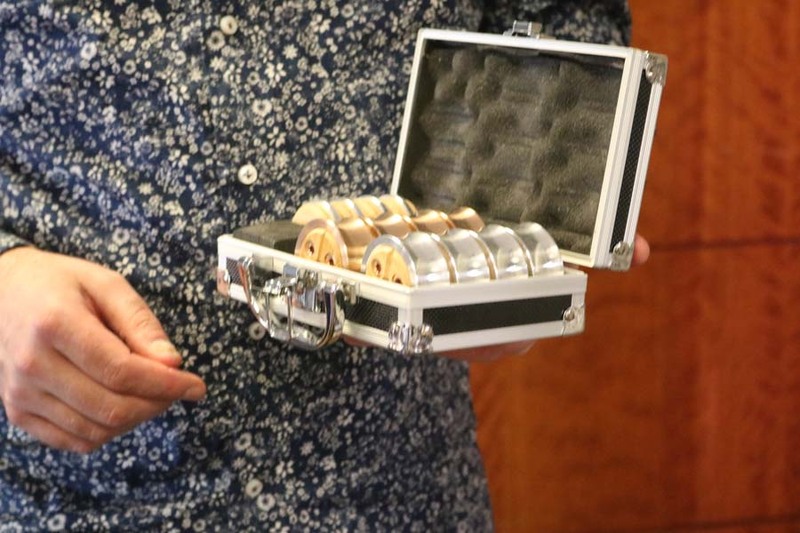 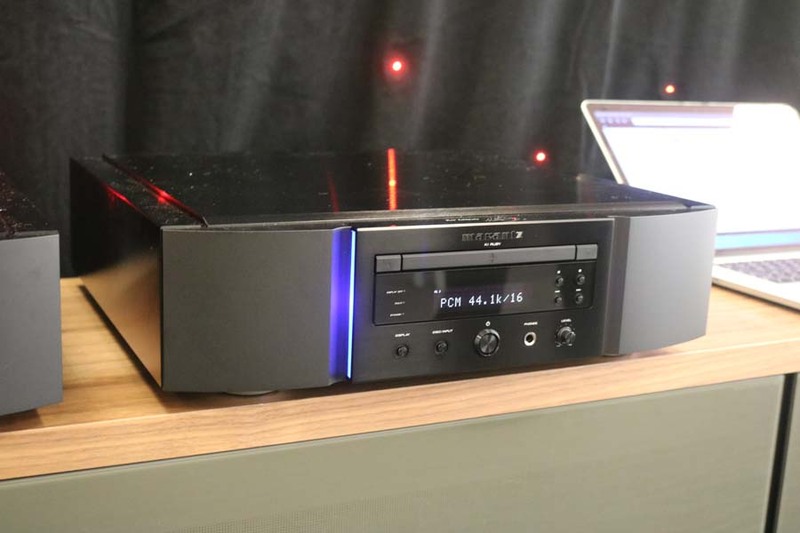 We were treated to a brief dem of the rack when compared to a more traditional affair and the PEEK rack certainly does something in tidying up the sound somewhat, though it is unlikely to be cheap with PEEK being one of the most expensive plastics in the world to buy. 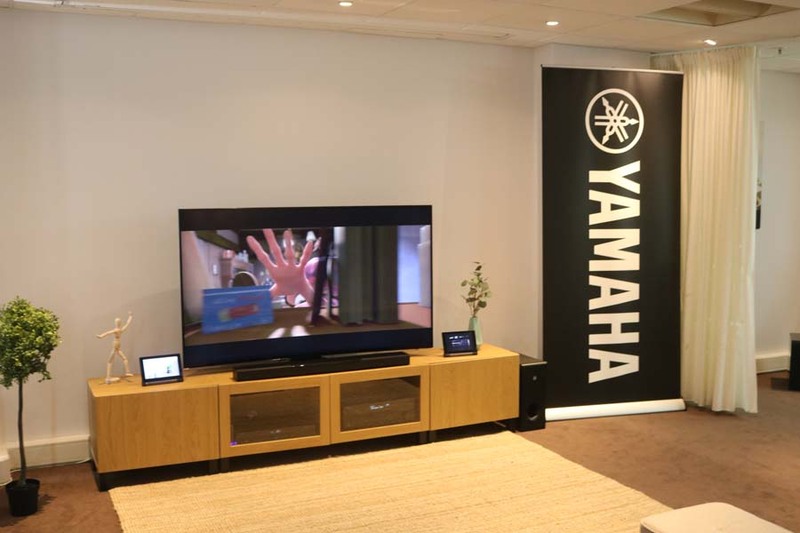 Next down the corridor were Yamaha and whilst the main event was a huge TV and associated sound system, what really caught my eye was a turntable called the Vinyl 500. 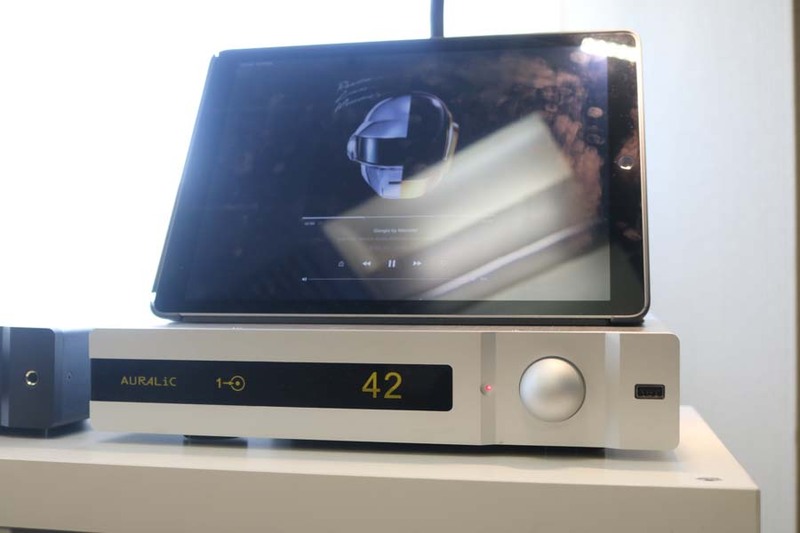 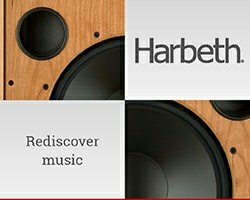 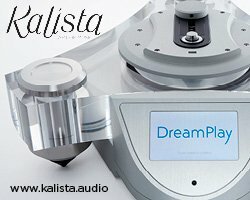 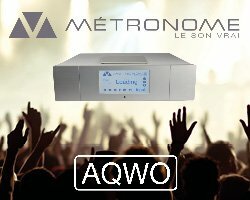 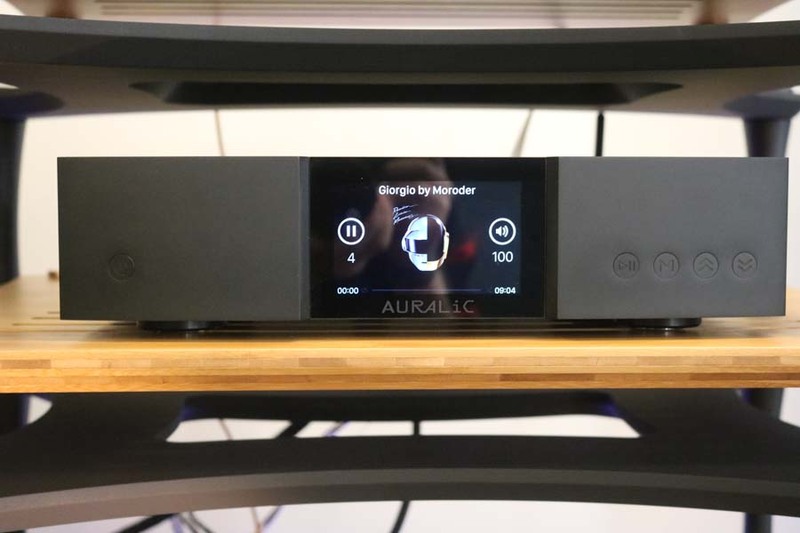 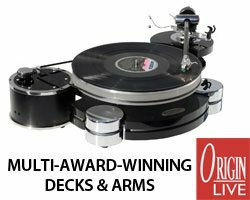 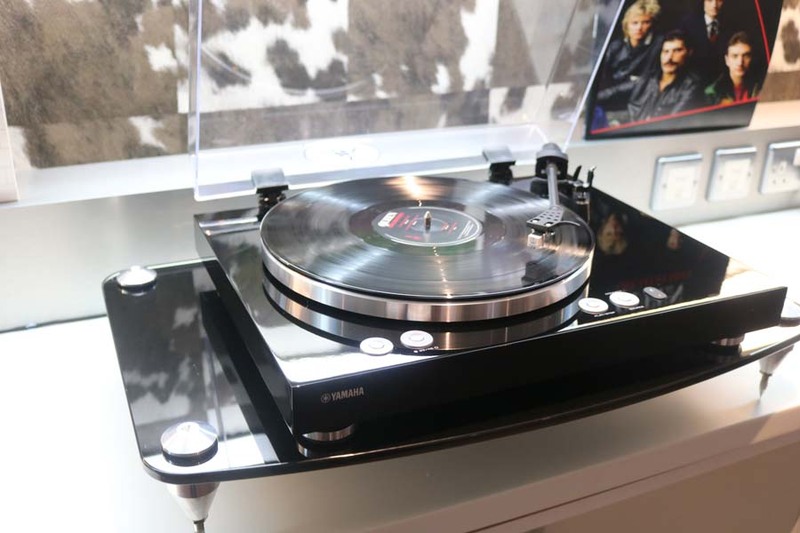 It costs £549 and comes with an arm and cartridge but where it differs from more conventional offerings is the inclusion of a built-in streamer that connects to whatever suitable speakers you have to hand, allowing you to stream vinyl around your house to pretty much as many speakers as you wish. 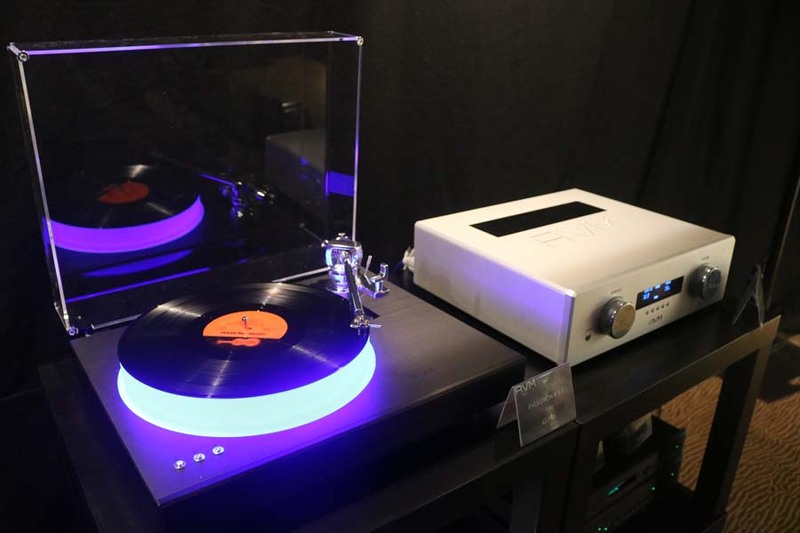 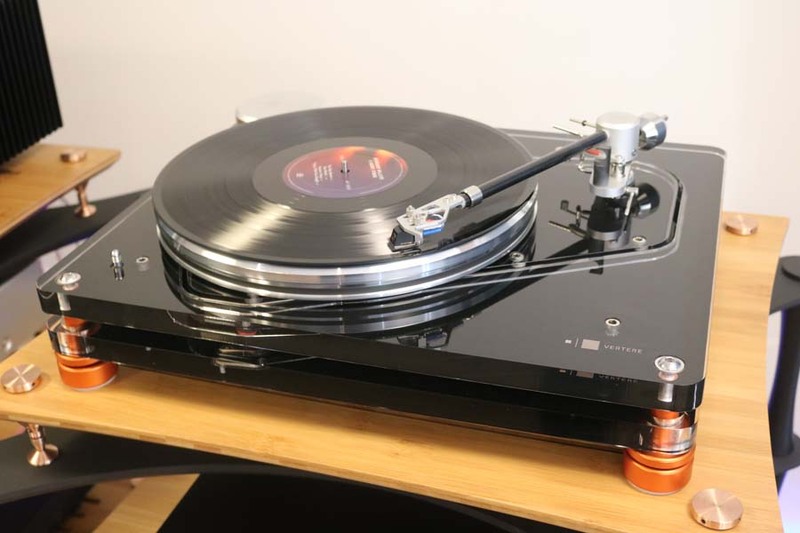 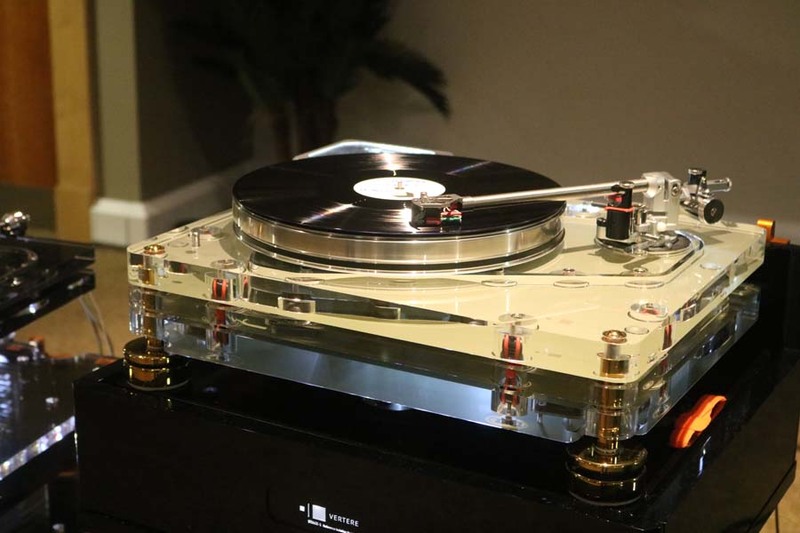 The Vinyl 500 also has Bluetooth connectivity. 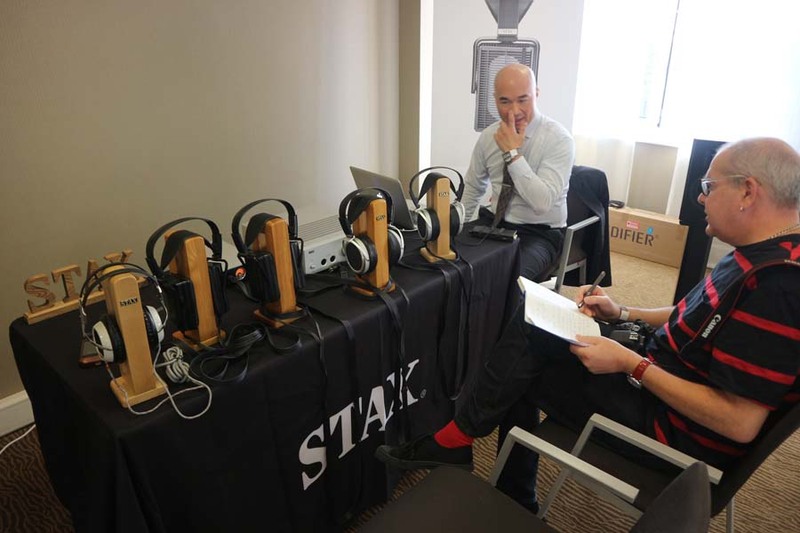 In the Stax room, most readers will be familiar with the name, I got the opportunity to listen to the company’s new flagship model, the SR009 costing $4600 (seen far right) with their new energizer, the SRMD50. 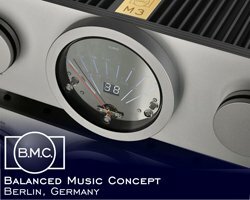 The SRMD50 not only acts as the energizer for the headphones but is also a DAC with inputs for USB, coaxial and RCA. 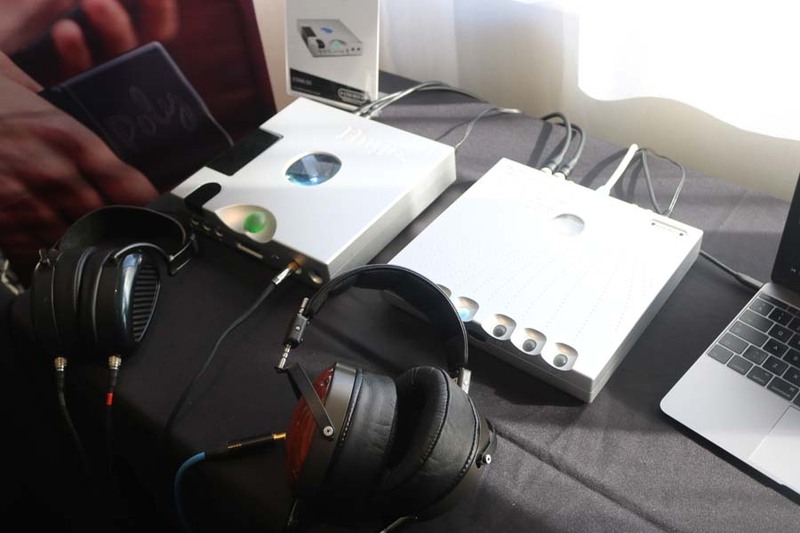 The headphones were very detailed indeed with a surprising sense of soundstage for headphones. 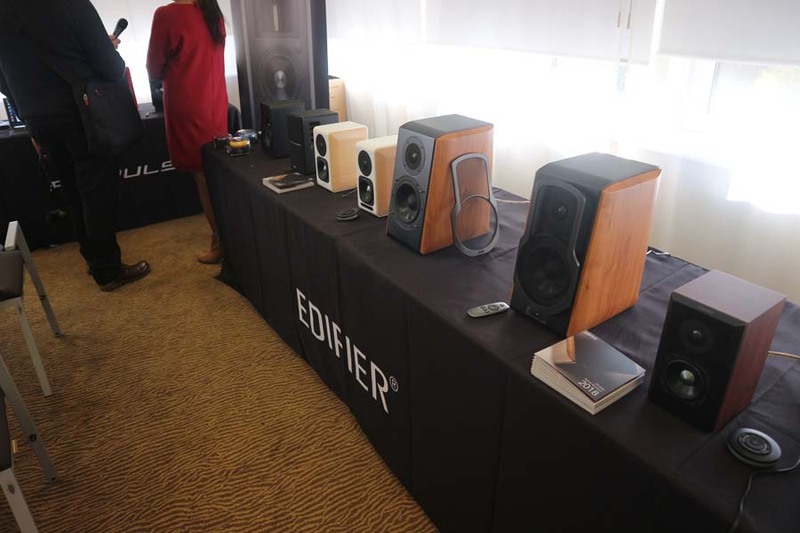 Also in the room were products by edifier which sadly we didn’t get to hear as the room hosts were dealing with proper visitors. 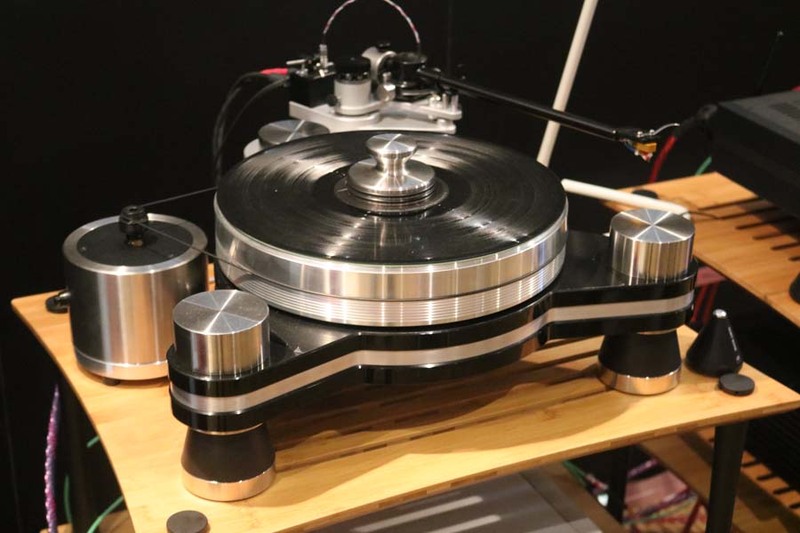 Michell Engineering will be another name familiar to readers for their range of turntables and today they were making a very pleasant sound using Sugden Class A and Audio Research electronics into Proac loudspeakers. .
Renaissance had a VPI turntable on show but were most keen to tell us about the mew Moon 390 streamer (£4800). 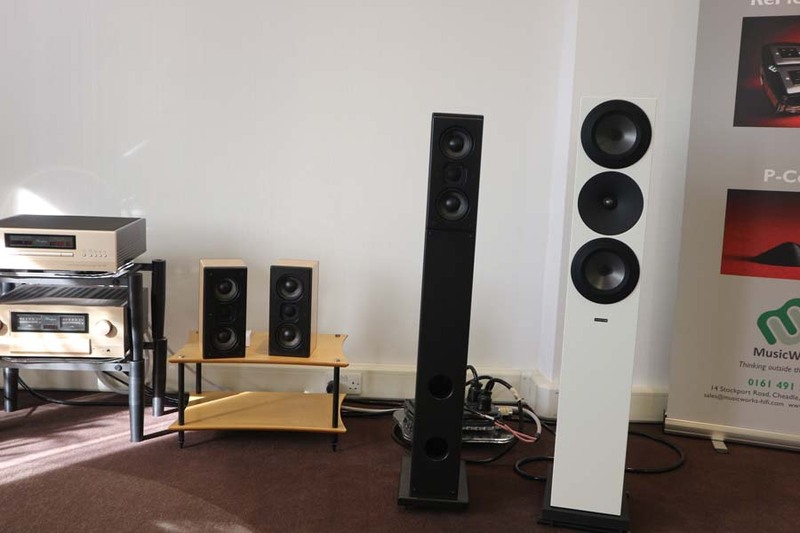 Moon monoblocs and a pair of Dynaudio Special 40s wired up with a loom of Nordost Heimdall cables completed the line-up. 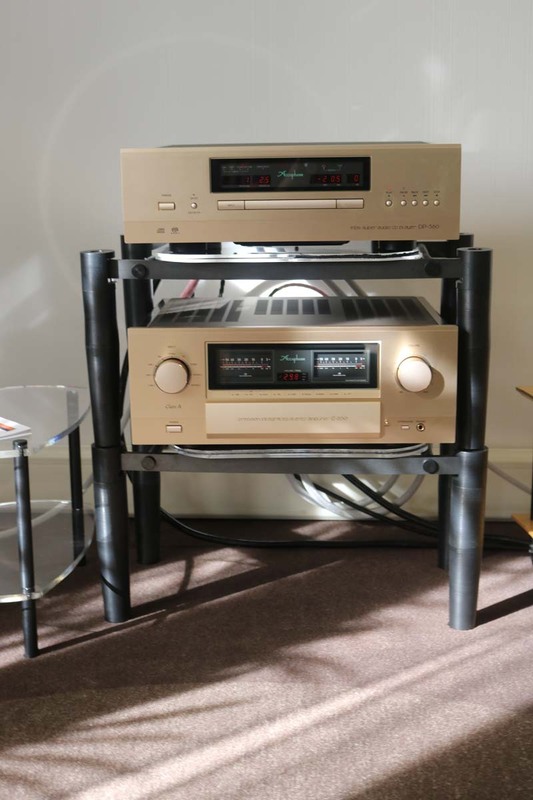 Now, the generally accepted notion is that HiFi has to cost an arm and a leg for it to sound great but bucking this trend were the Audiolab and Wharfedale room. 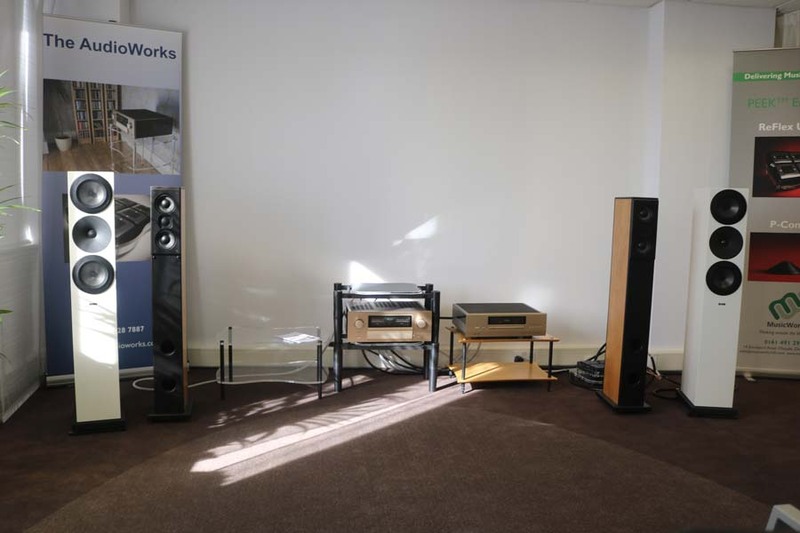 Costing just £1179.85 for the full system this room punched well above its weight with the new Audiolab 6000 series amp and CD player feeding a pair of Wharfedale D300 loudspeakers. 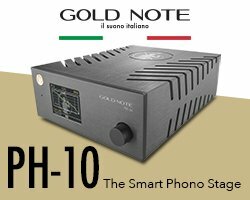 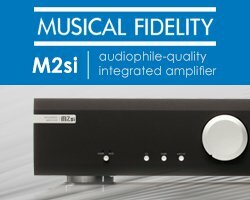 It is refreshing to see real Hifi at a price that is really entry level and I expect these to be bought in big numbers as starter or second systems. 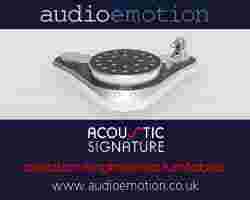 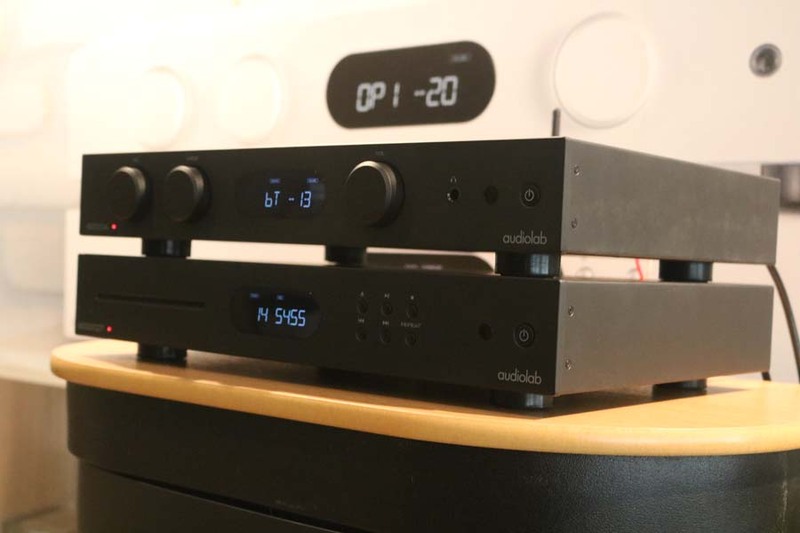 Expect a world exclusive review of the Audiolab combo very soon on Hifi Pig. 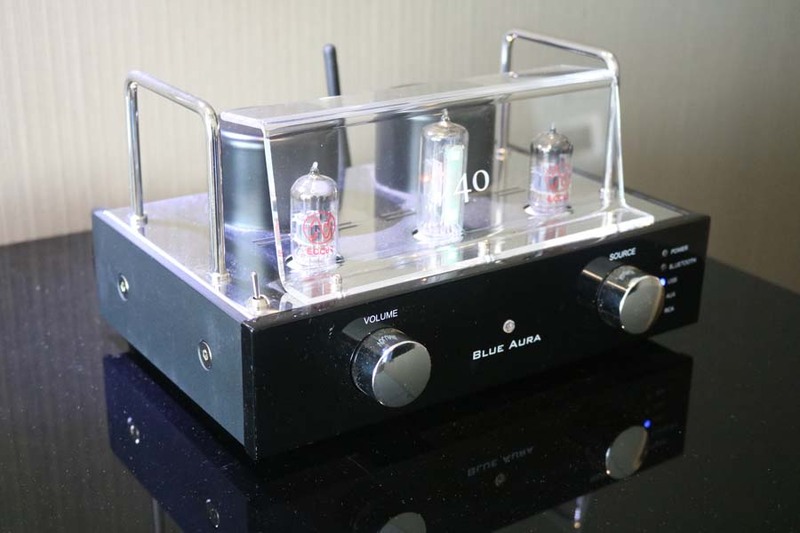 Blue Aura produce a range of funky looking and inexpensive kit using valves. 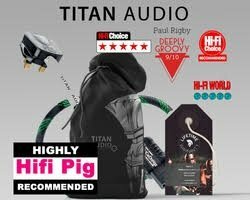 We’ve asked previously for review samples as we really do think readers will be interested in this entry level kit but sadly nothing has been forthcoming. 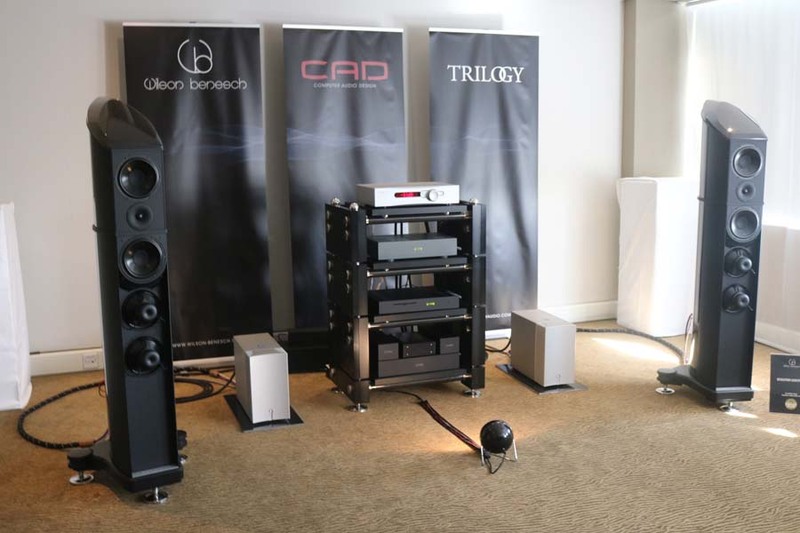 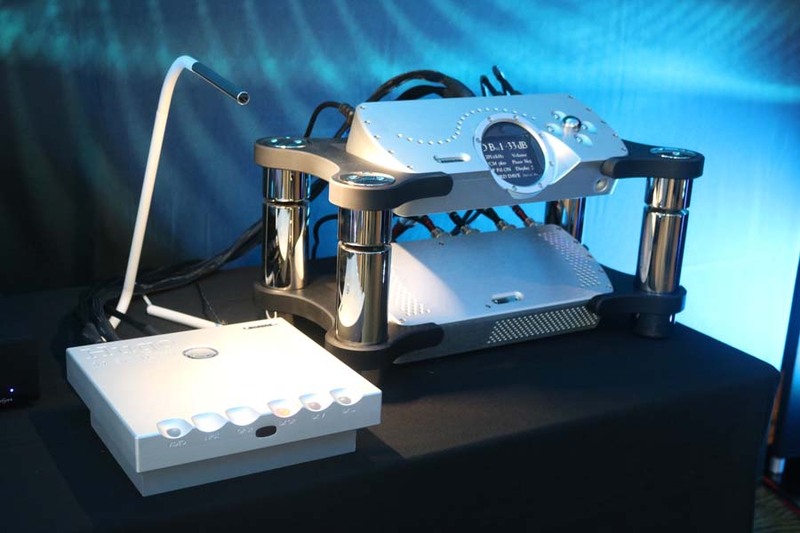 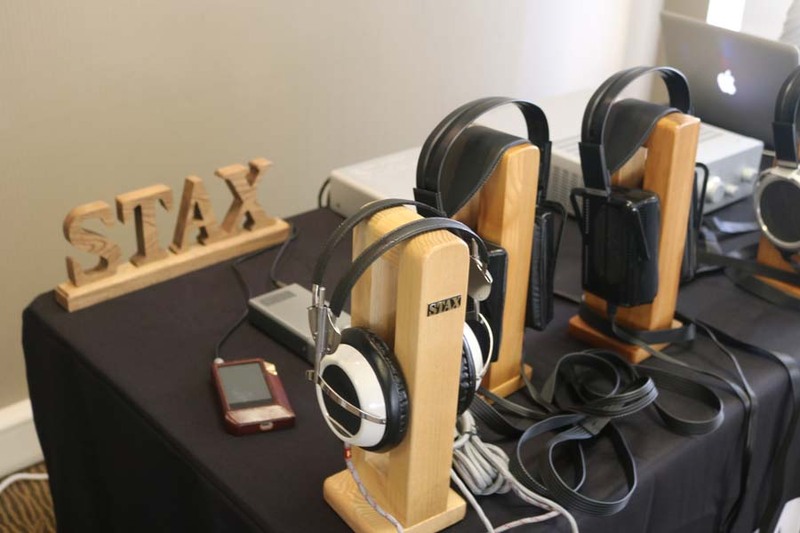 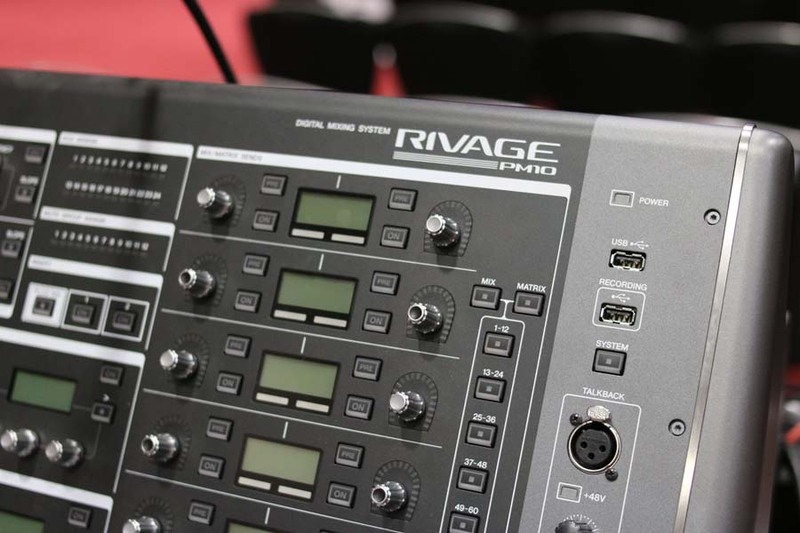 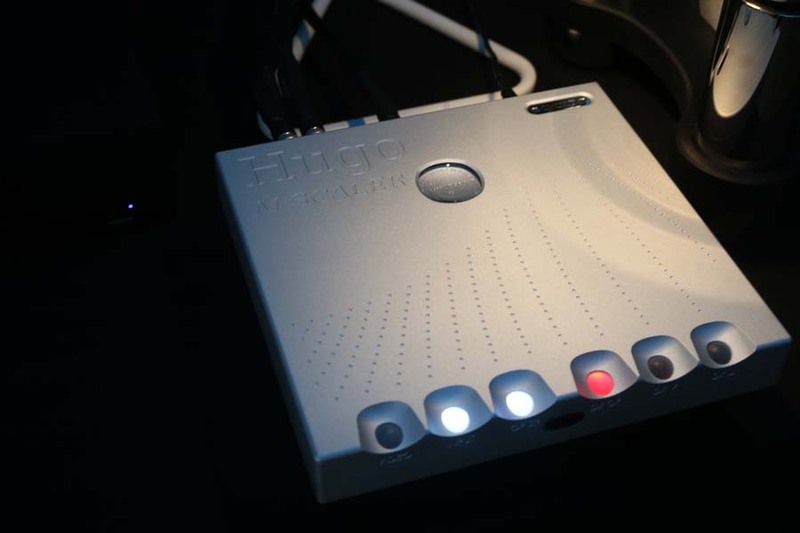 Wilson Benesch partnered with Trilogy and CAD for Festival Of Sound. 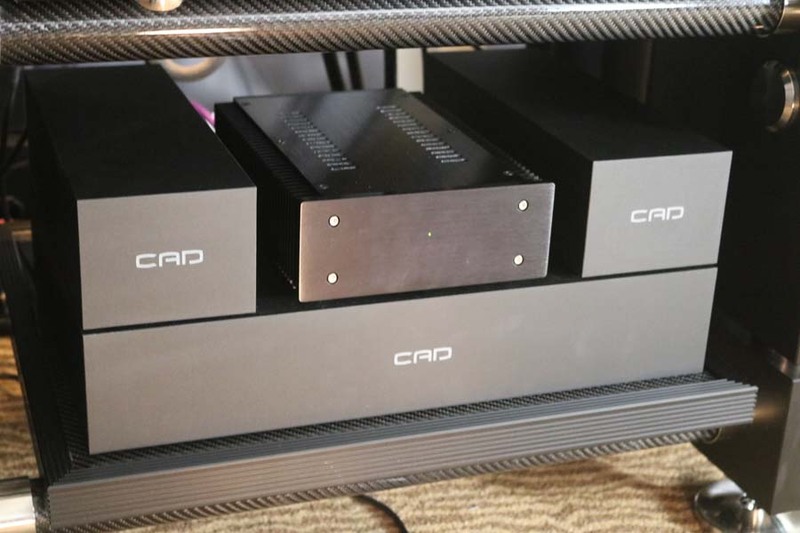 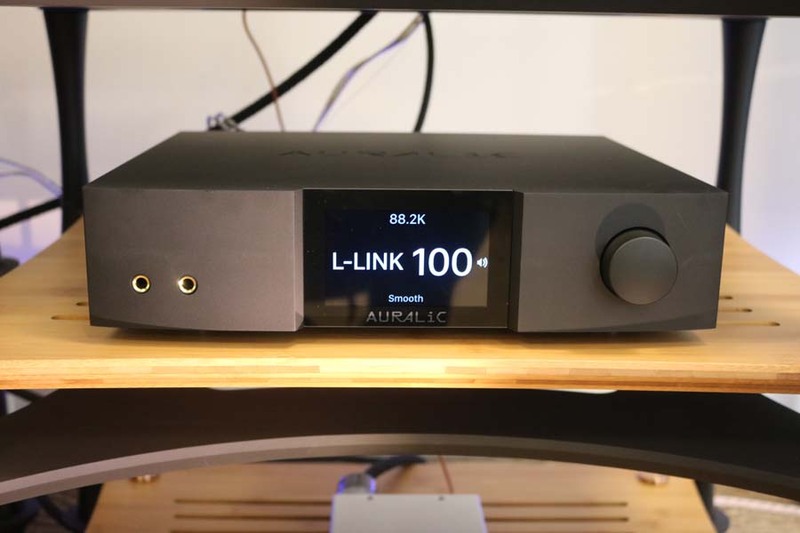 In the room from CAD was the 1543 MKII DAC (£8950), the CAD Audio Transport (£12000), USB I cable (£600), USB II cable (£990) and the GC1 and GC3 Ground Control boxes (£1695 and £3995). 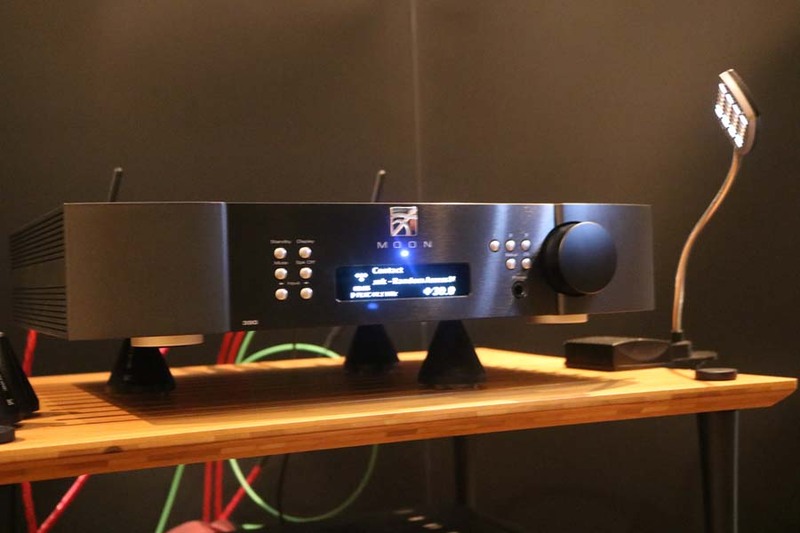 Trilogy provided amplification with their 915R Reference Vacuum Tune Preamp (£14995) and 995R reference Hybrid Mono Power amps (£11250 each). 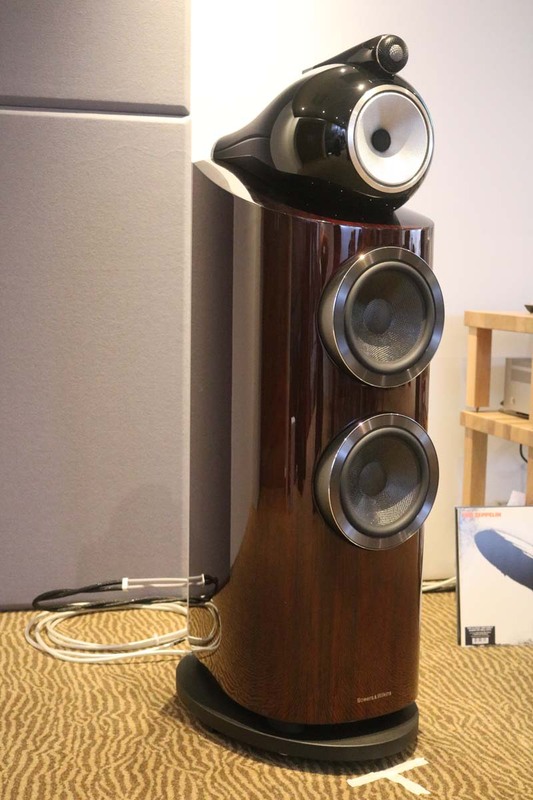 Moving the air in the room were a pair of Wilson Benesch Resolution speakers that use a carbon fibre-alloy enclosure and bespoke hand-built drivers (£35500). 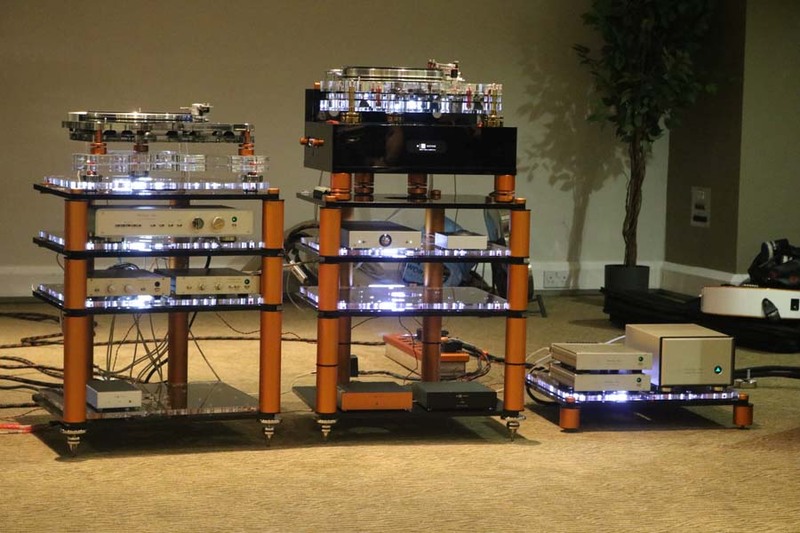 The electronics were on the Wilson Benesch R1 rack costing £4950 per level. 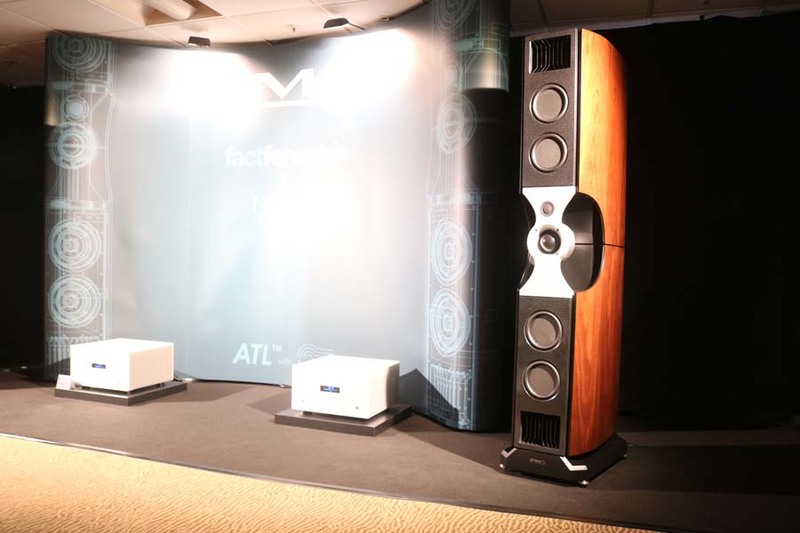 High-end prices producing a world-class sound my notes tell me. 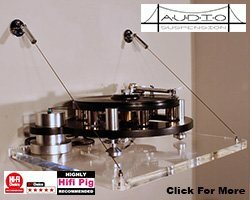 Cabasse, Quadraspire, Auralic Heed and Parasound joined forces in the next room and were making nice noises. 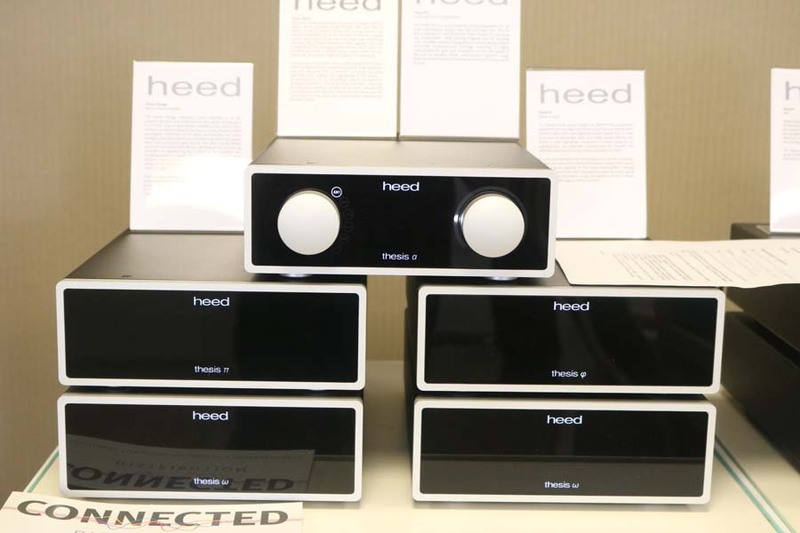 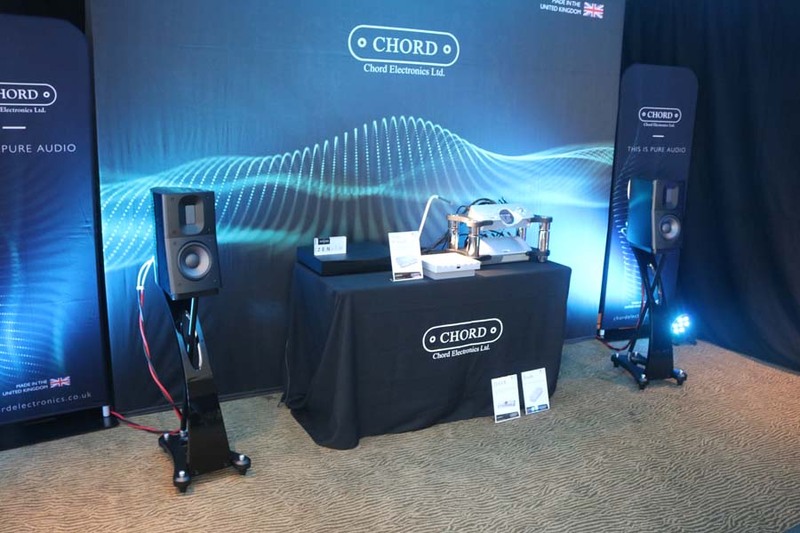 Chord Company debuted three brand new products at Festival of Sound. 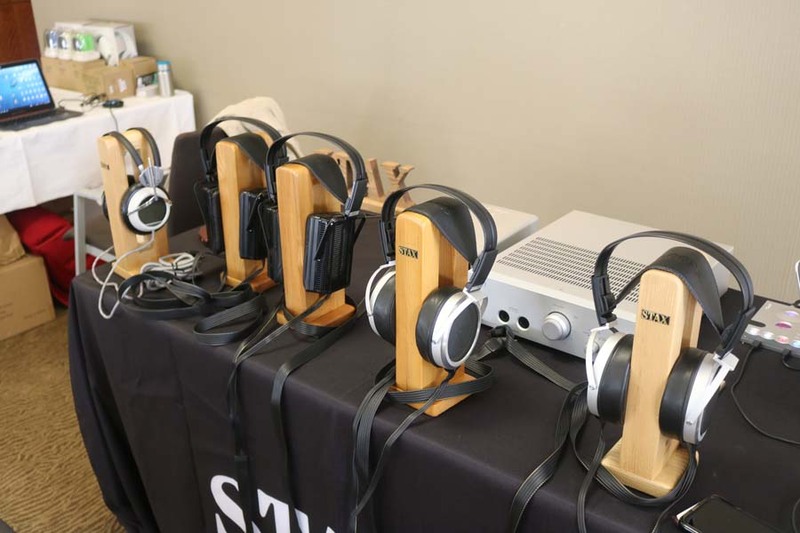 Visitors had the opportunity to experience the recently announced SignatureXL speaker cable, plus two brand new products also making their international debuts: RumourX and ShawlineX speaker cables. 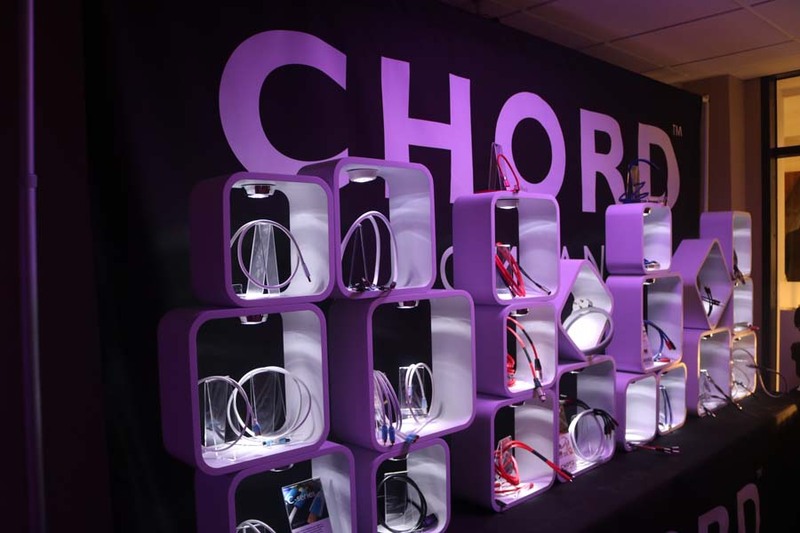 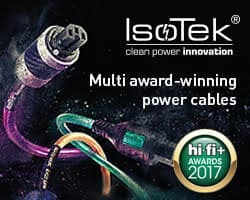 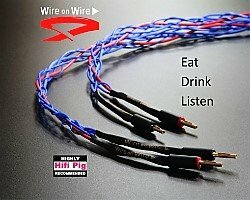 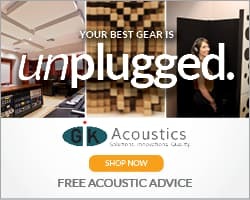 The new trio of cables are the first products from Chord Company to feature the new high-performance dielectric, XLPE (Cross-linked Polyethylene), which was first announced in the SignatureXL speaker cable earlier in the month. 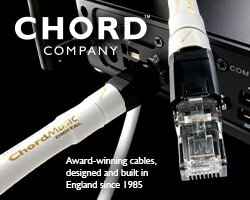 The new cables also feature Chord Company’s new ChordOhmic silver-plated speaker plugs, which are now available with all factory-terminated speaker cables, in addition to being available separately in spade and banana plug variations. 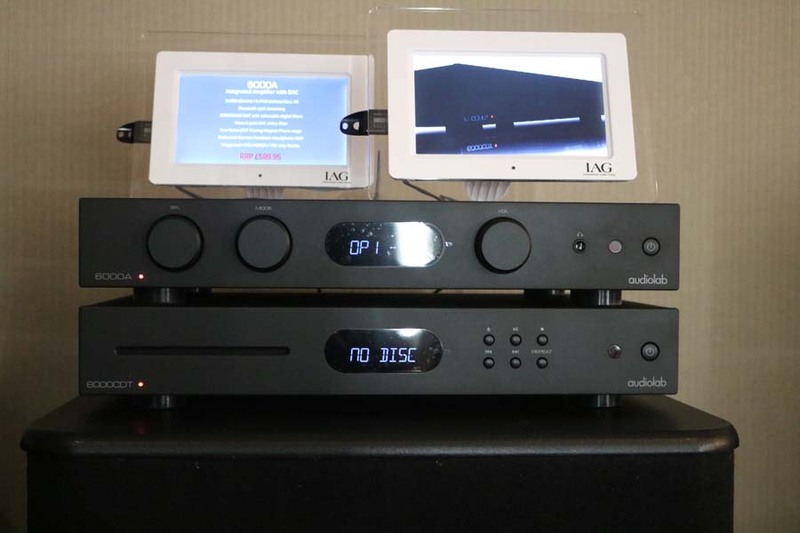 Chord Electronics were making a fine sound in their room using the Zenith streamer from Innuos into the Hugo M Scaler which in turn fed the fabulous DAVE DAC. 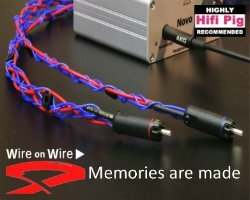 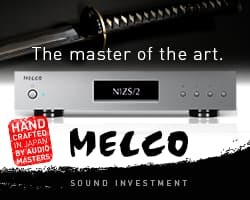 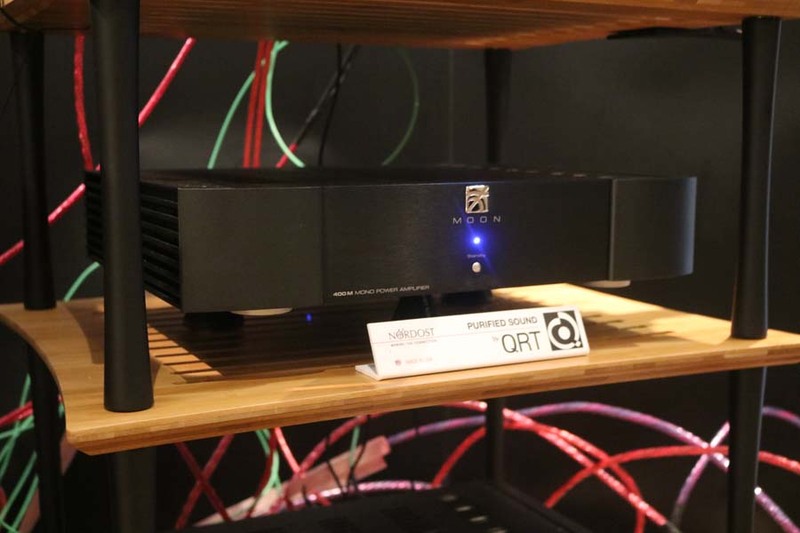 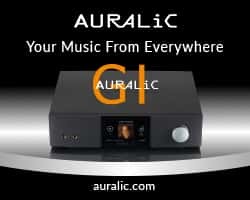 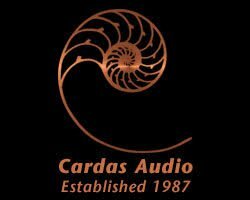 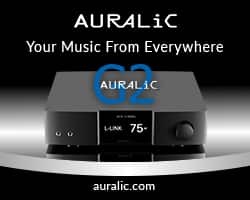 Amps were the new ETUD which debuted at the North West Audio Show in June but this was the first M Scaler with DAVE (review of DAVE here) showing in the UK. 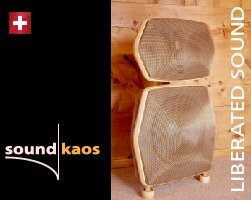 Loudspeakers were from Raidho. 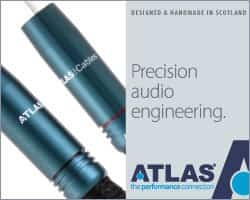 The M Scaler is an interesting product; feed in 44.1 and it spits out 705.6, feed in 48 plus and it will spit out 768. 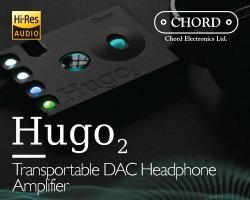 All are shipping now or very soon in the UK. 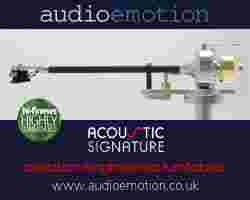 Moz who was running the room played us a bit of Green Day and my notes describe the sound as being very detailed indeed…actually they use an expletive but we’ll not publish that here. 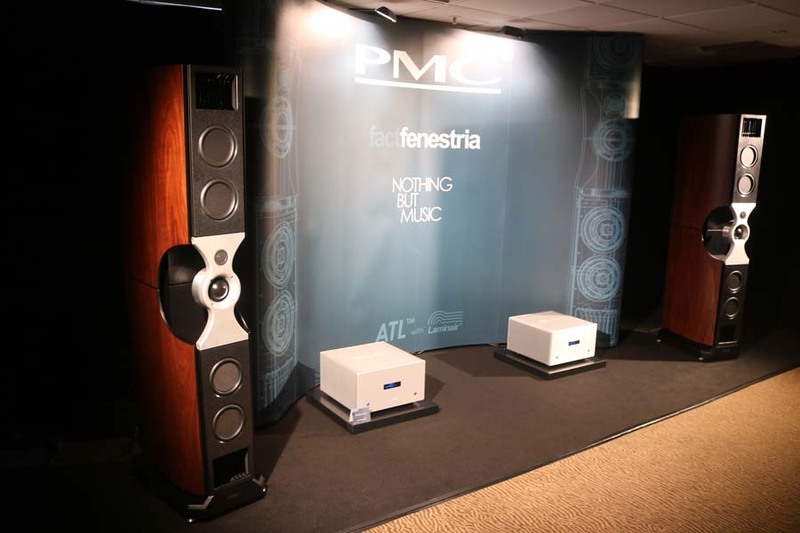 PMC were playing some Steve Gadd (interestingly recorded using PMC speakers) through some big AVM monos and the FACT Fenestria loudspeakers that launched at Munich (£47000). 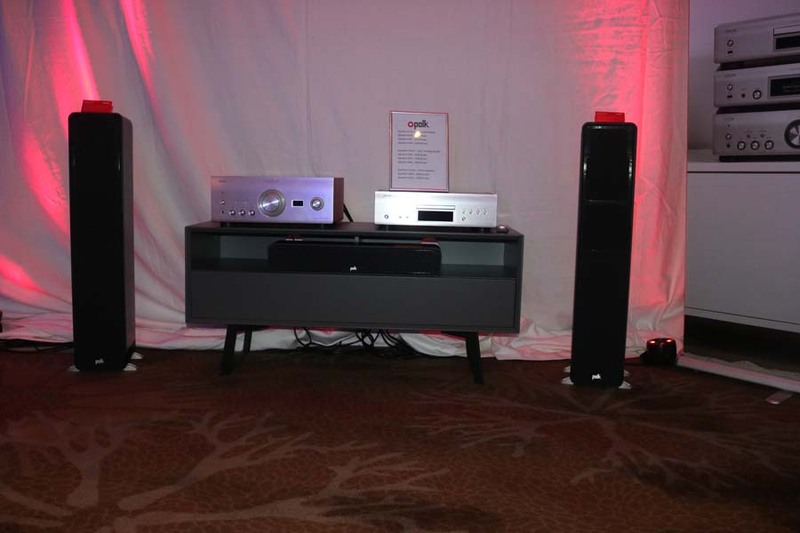 What really impressed about this system was the sheer scale of the music and the dynamics on offer with a very tight and controlled bass. 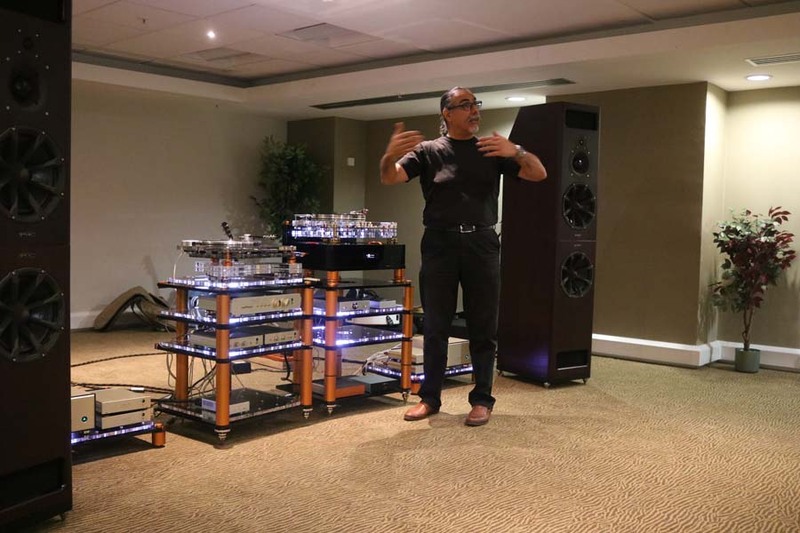 For me this system really was one of the most impressive sounds I’ve ever encountered at a show and I could have sat there for a lot longer than I did but sadly we had to move on. 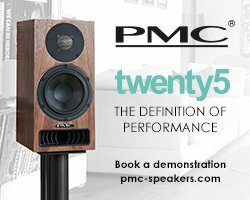 Also, sadly we were in the PMC room at the same time as PMC’s MD Peter Thomas and Chris Difford were doing their PMC and The Music Makers talk – one of the many talks dotted throughout the day that were free for visitors to attend. 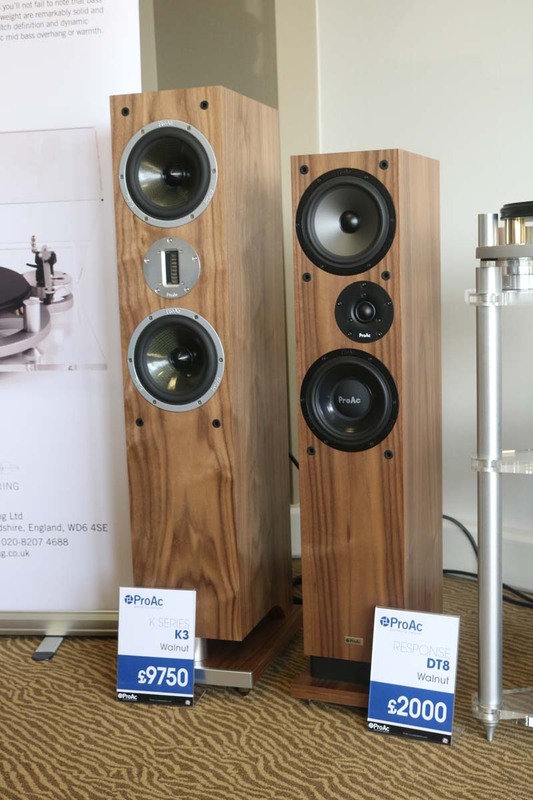 Sadly, given our time constraints we got to see precisely none of these, but I think their inclusion is an interesting concept that adds good value to attendees to the show and I hope the organisers continue to offer these in coming years. 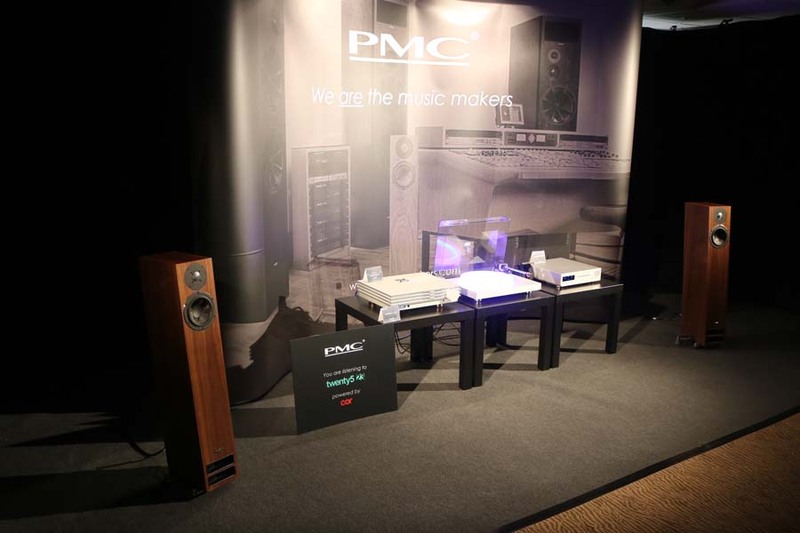 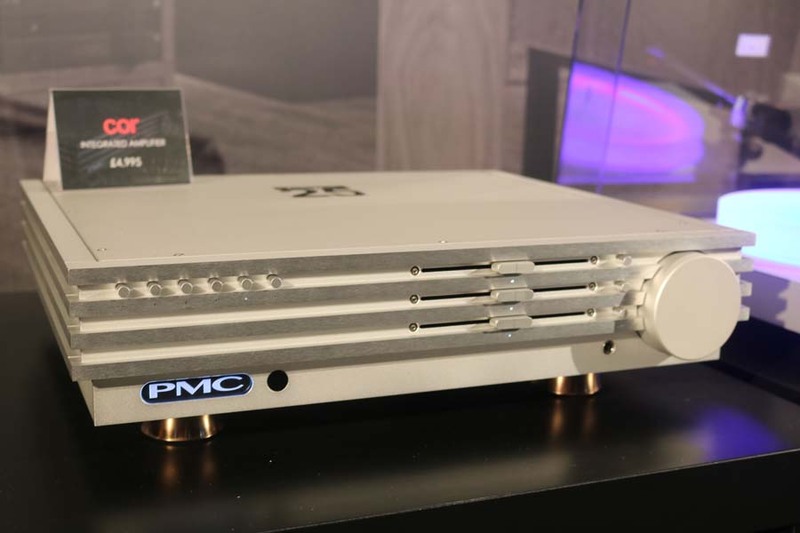 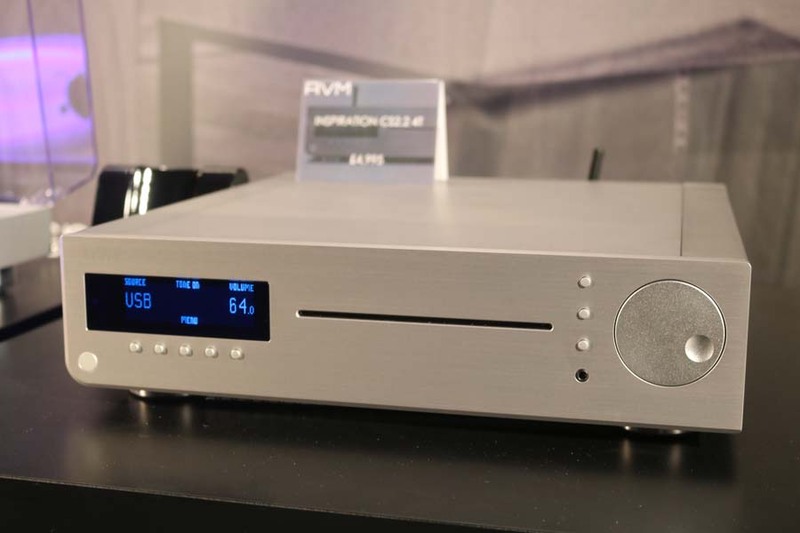 PMC had a second room next door based around the COR integrated amp (£4995), an AVM Inspiration CS2.2.4T (£4995) and a pair of PMC twenty 5 23 speakers (£3295). 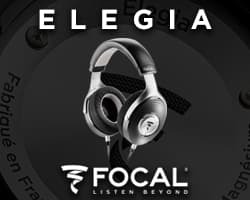 Clearly there is a family sound that echoes the Fenestrias only on a smaller scale. 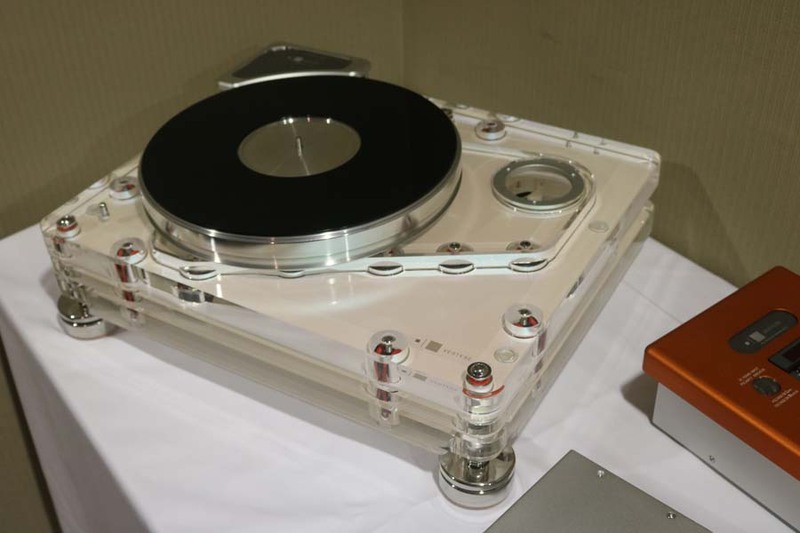 Also on the rack you will notice the very cool looking AVM turntable that was launched at Munich earlier this year. 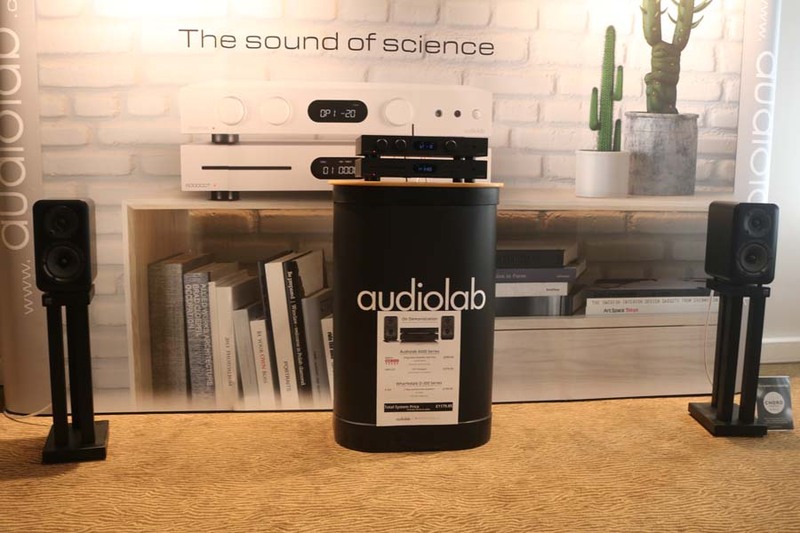 I’m not a huge fan of AV systems, but Definitive Audio Technology’s room (we heard their speakers first at Munich) was really impressive using Dolby Atmos. 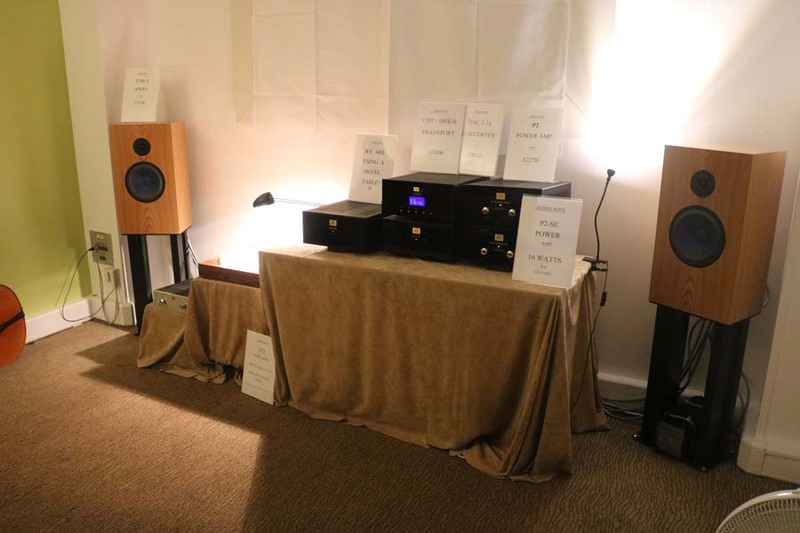 Sadly this room was far too dark for me to take any photographs. 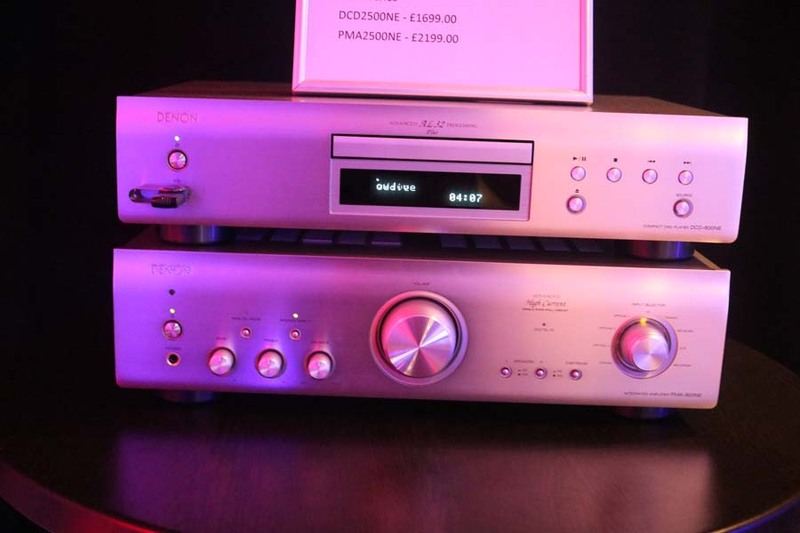 However, in the same room were Denon separates and Polk Audio loudspeakers, again proving that real HiFi does not have to cost a fortune. 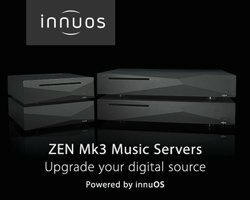 Innuos were represented in a good number of rooms and with good reason. 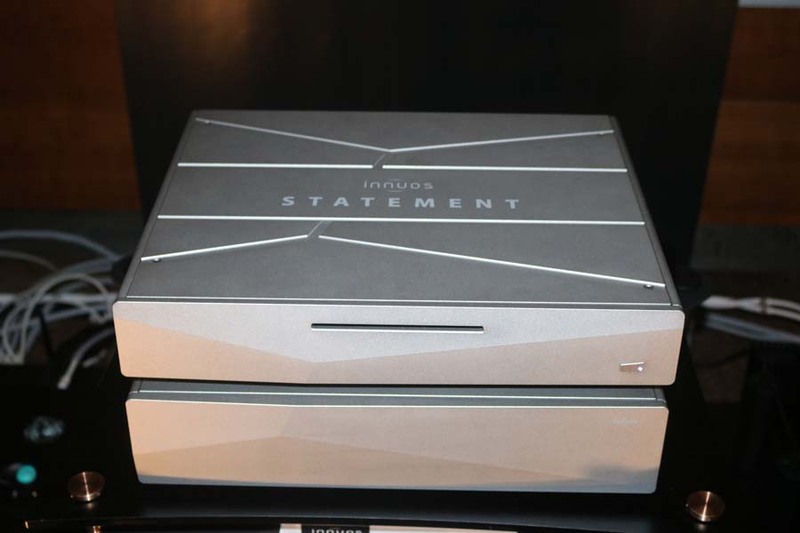 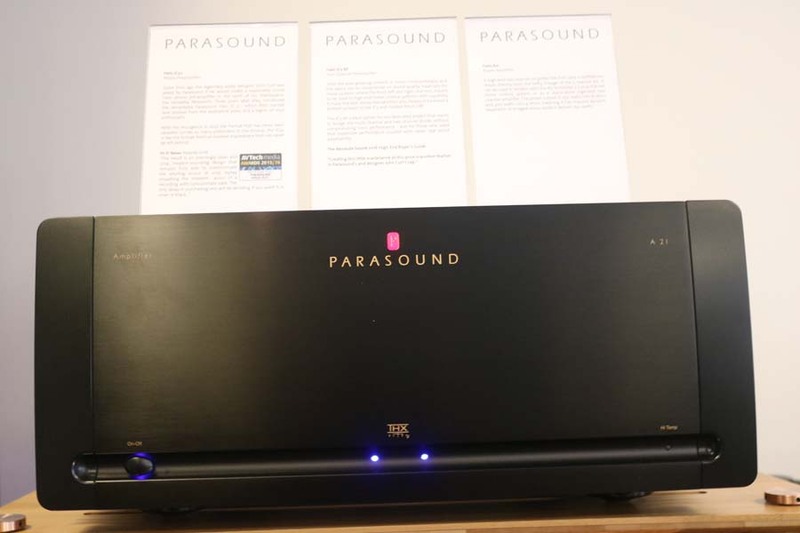 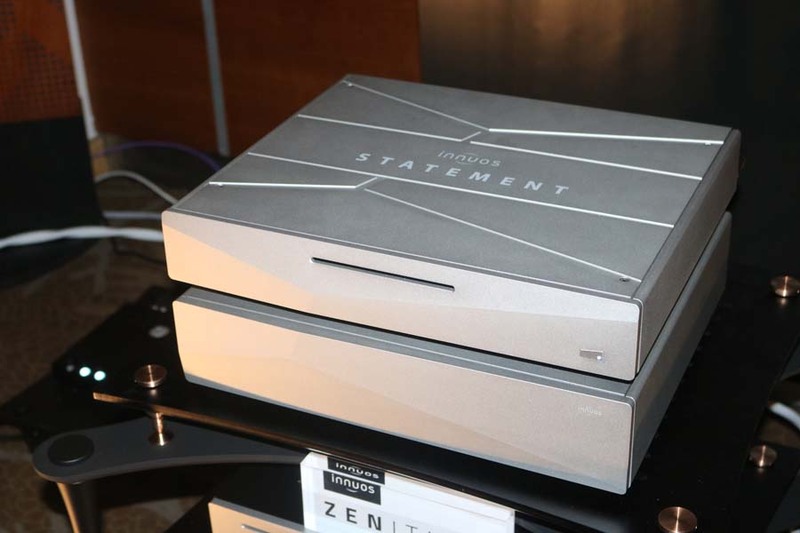 Their streamers certainly deliver the goods in terms of sound quality and their Statement streamer, now in its final production stylings (from £9800), certainly looks the part too. 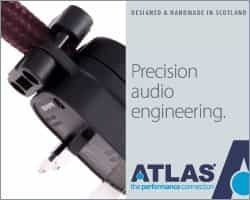 The Statement has 10mm Aluminium all around to help RF etc shielding and comes with the matching 8 Linear power supply. 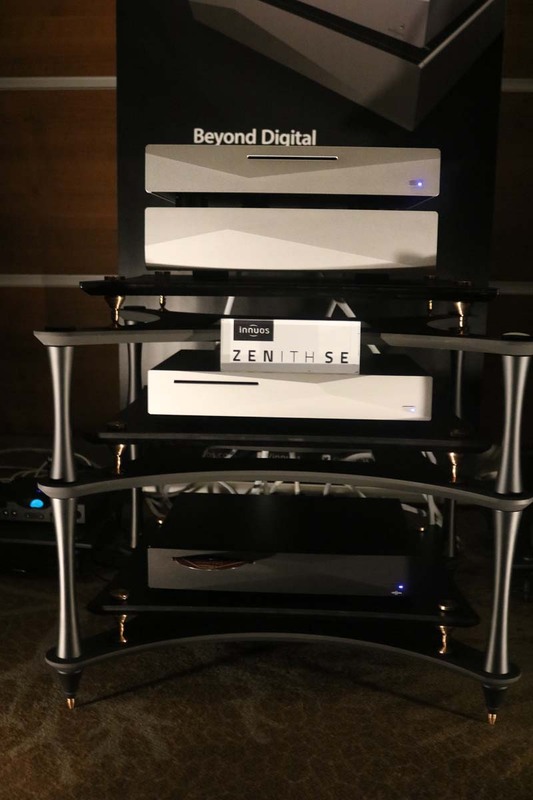 There are now two umbilical cables connecting the PSU to the streamer and the dem when comparing the Zenith SE to the Statement and playing Kraftwerk’s Robots is impressive. The SE is certainly no slouch in the sound-stakes but the Statement just adds more detail and more depth to proceedings. 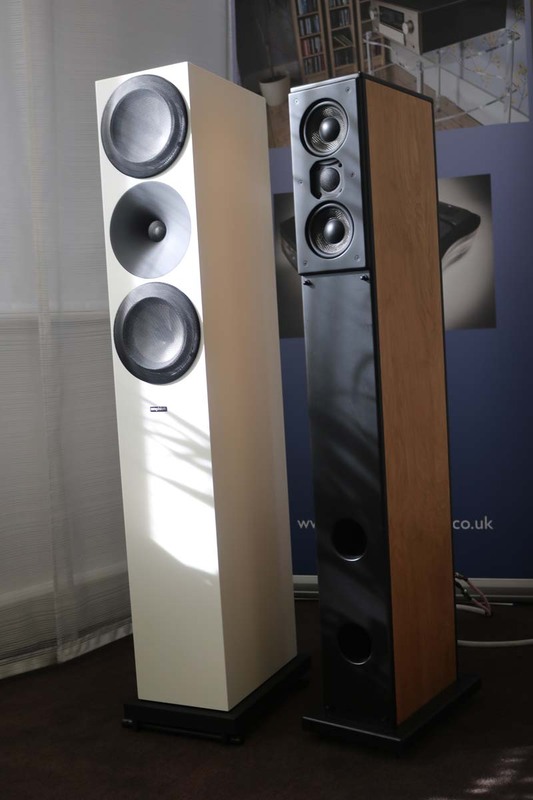 If you get a chance to hear this dem at a show or at a retailer’s then you certainly should make the effort to hear it, it really is rather impressive. 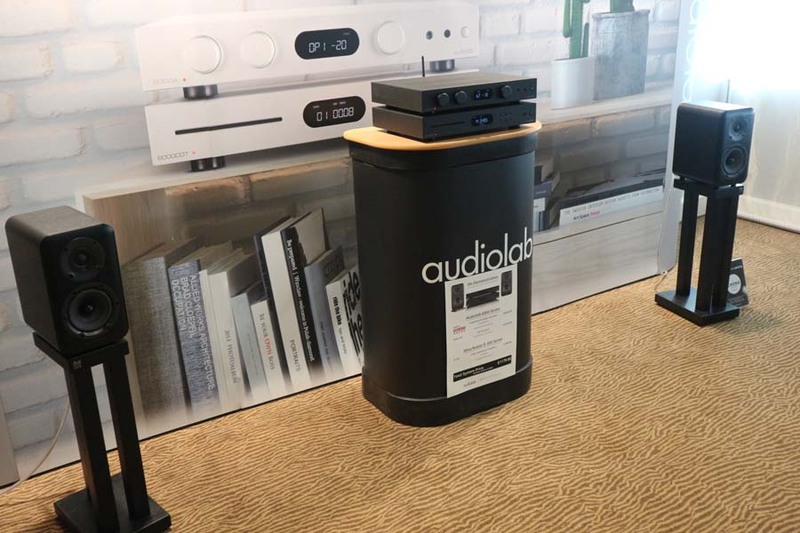 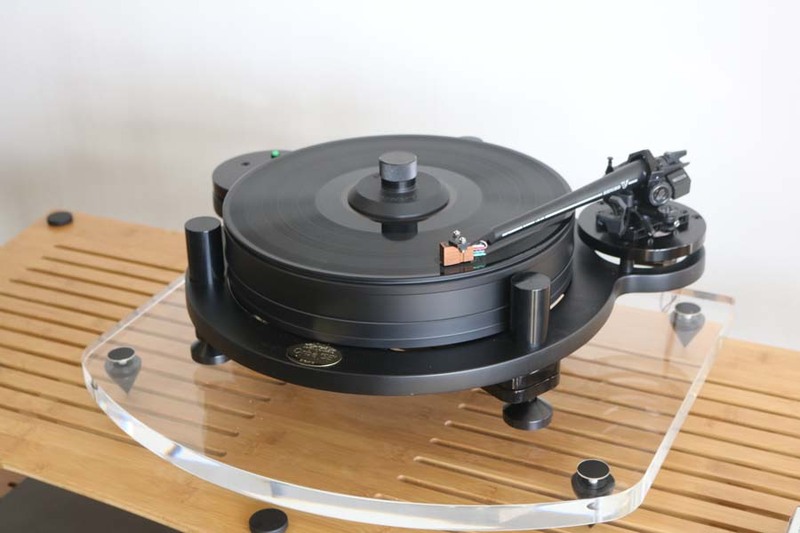 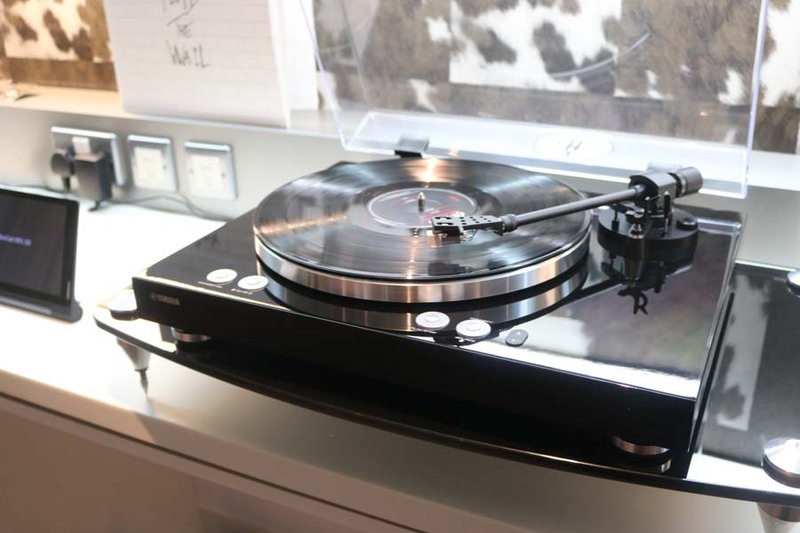 Audio Note were demoing their Type J speakers and their TT2 turntable when we went in the room and whilst the TT2 is no entry level turntable I was surprised it was available from £1418 in its vinyl covered guise and £2420 in wood. 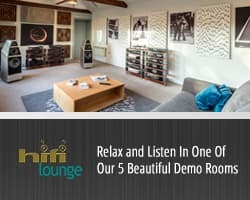 I’ve often criticised Audio Note rooms at shows for not sounding particularly good but the last few shows I’ve attended for Hifi Pig they have really impressed. 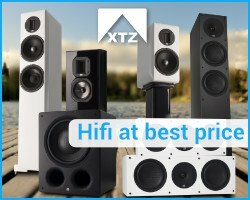 Prices for electronics also seems to be fairly reasonable. 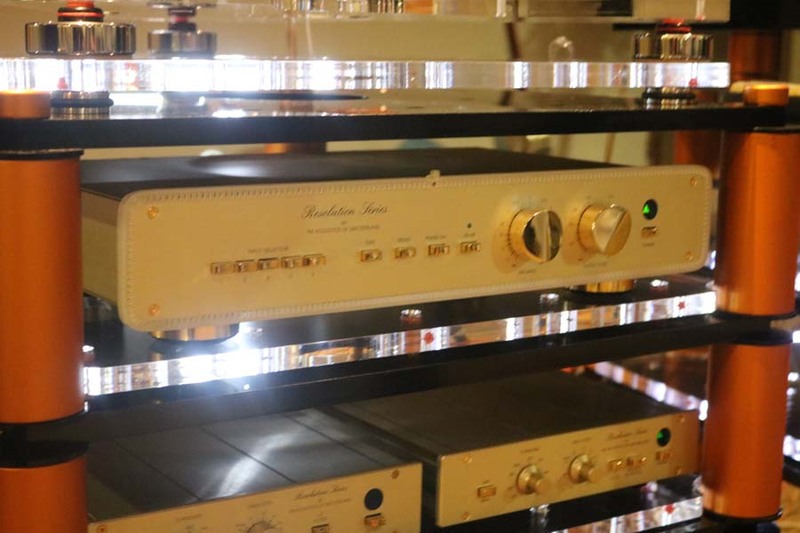 Vertere had a huge room and lots of equipment which added up to a formidable price but wow, what a sound. 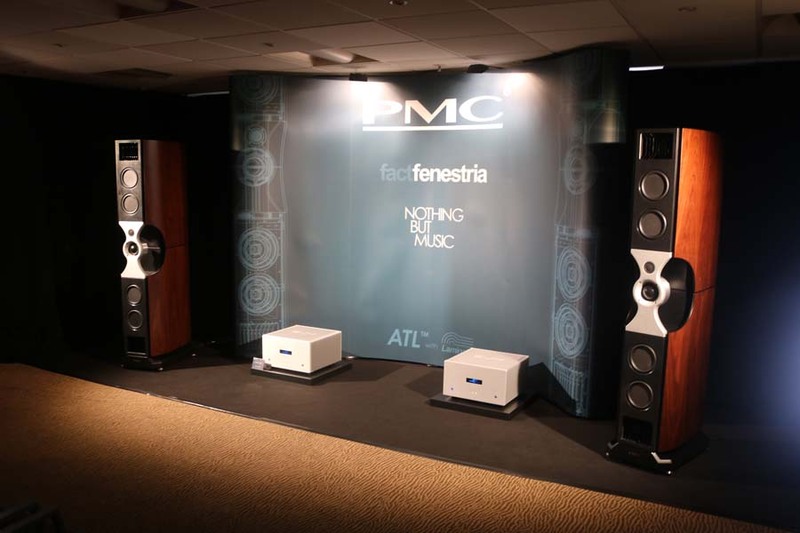 FM Acoustics electronics, Vertere record players ( I love that Touraj calls them record players) and a huge pair of PMCs speakers produced a sound that when I sat at the front of the room I found a little overwhelming in the bass, but moving to the rear of the room everything clicked into place beautifully. 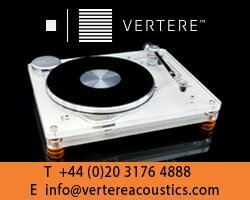 We were also treated to some live music from Elles Springs whose record Reveal is out now on Vertere. 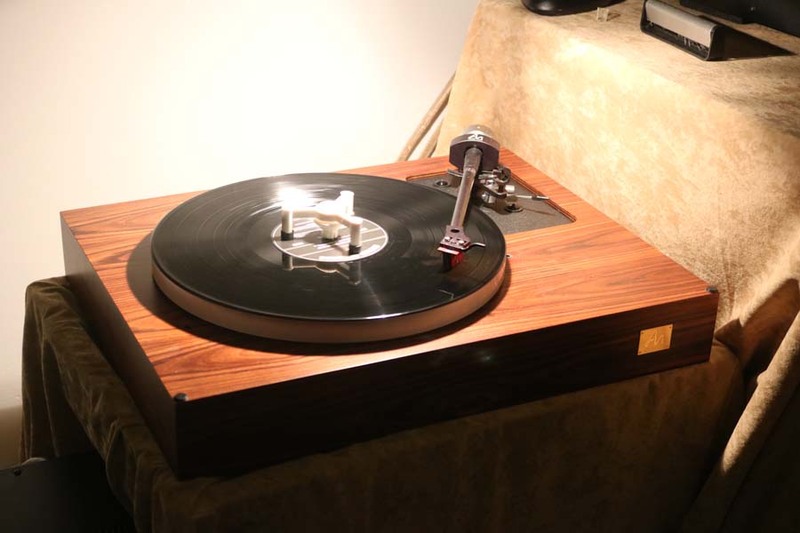 The LP has been tape transferred and half speed mastered by Miles Showell. 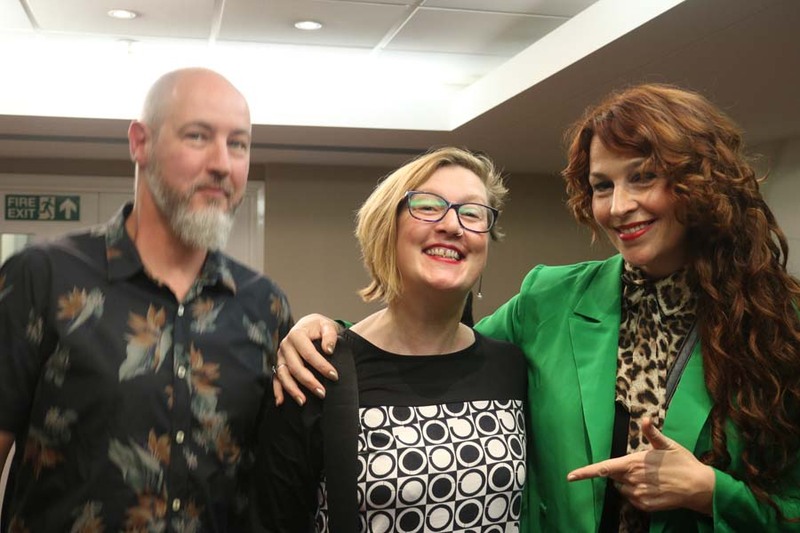 She has a wonderfully pure vocal tone and heart-wrenching lyrics and is most definitely worth checking out should you get the opportunity to see her live…or just go buy the record. 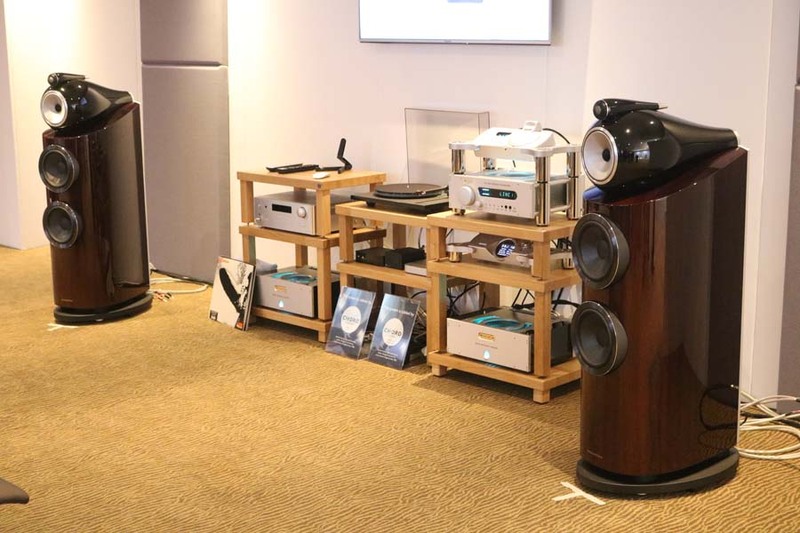 Naim and Focal had a very busy room with Focal’s range-topping Grandé Utopia EVO 3 and Stella Utopia EVO 3 loudspeakers being demonstrated to the public for the first time. 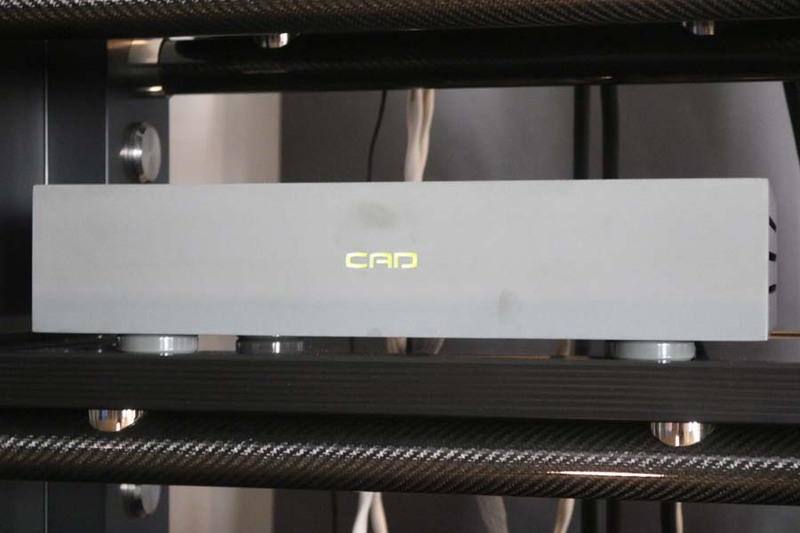 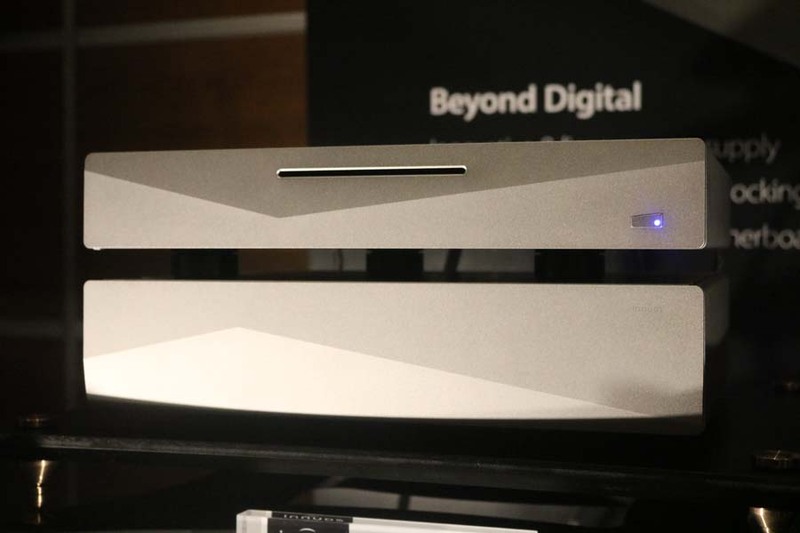 Driven by Naim Audio’s Statement NAC S1 and NAP S1 amplification paired with the company’s ND 555 reference network player, this system, is valued at a cool £350,000. 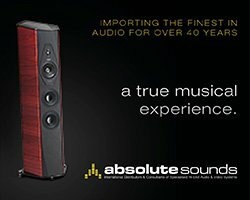 Yep, that is an awful lot of money but what a sound was being produced with my notes reading “deep, tight and textured”. 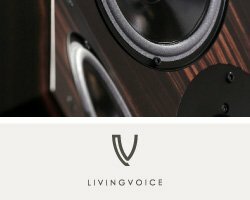 The speakers alone cost £160K and sport a new crossover and new bracing around the drivers coming together to a product that weighs in at 180Kg. 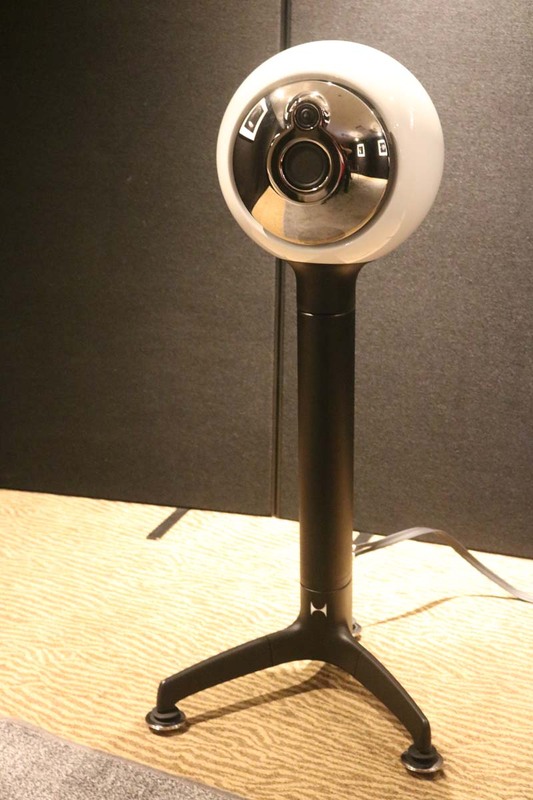 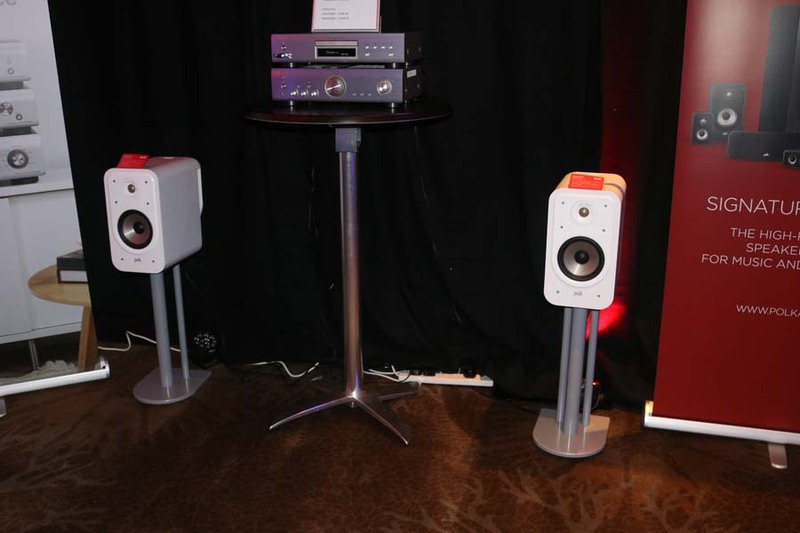 The Festival of Sound also saw the UK exclusive launch of Focal’s Kanta No.3 and Kanta No.1 loudspeakers. 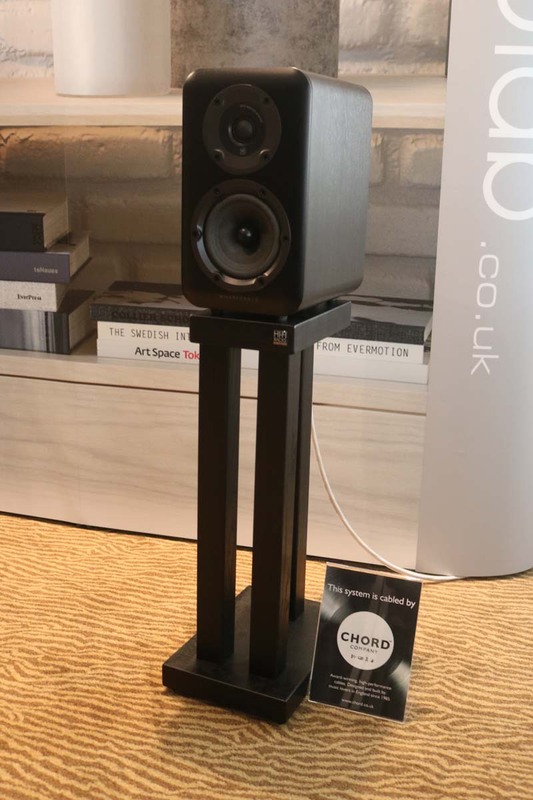 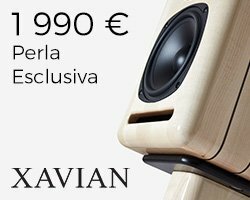 Completing the Kanta range, which was launched in 2017 with the arrival of the Kanta No.2, the Kanta No.3 is a 3-way floorstanding speaker system, utilising Focal’s Beryllium tweeter and Flax driver cone technologies. 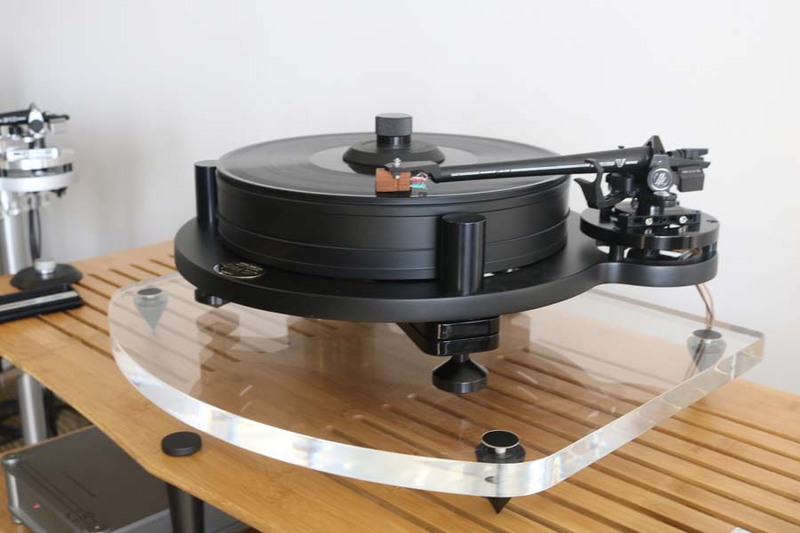 For smaller rooms, the Kanta No.1 combines the same technology into a stand-mount design. 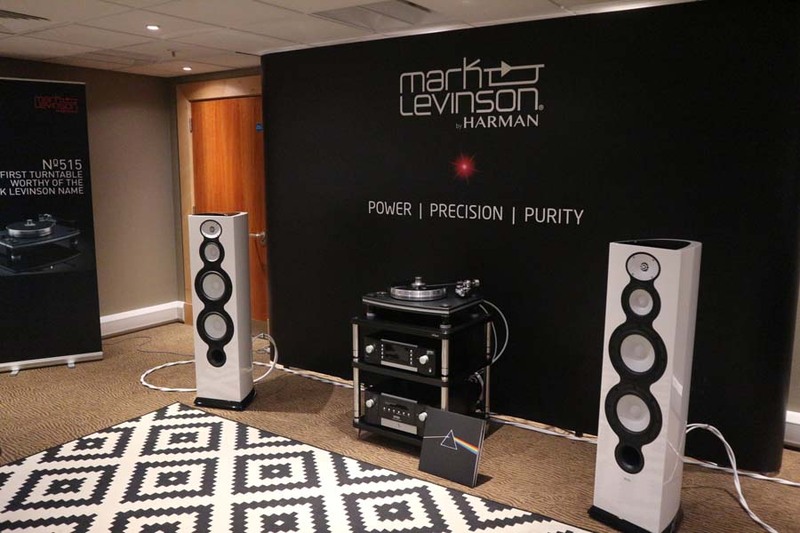 The Mark Levinson and Revel room was up next and they were playing Dark Side Of The Moon and whilst the mid-band was really gorgeous and detailed I don’t think this system delivered on the day with me commenting that the sound was light and just not very dynamic. 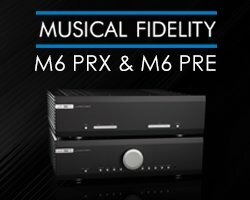 I have heard Mark Levinson kit sounding MUCH better than this. 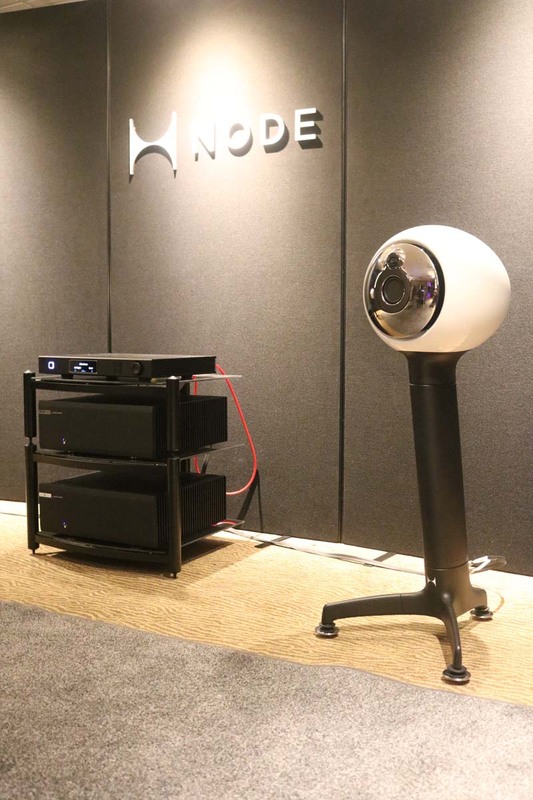 We first heard Node, a speaker that looks very unusual, at the North West Audio Show when the speaker was not quite at production spec’. 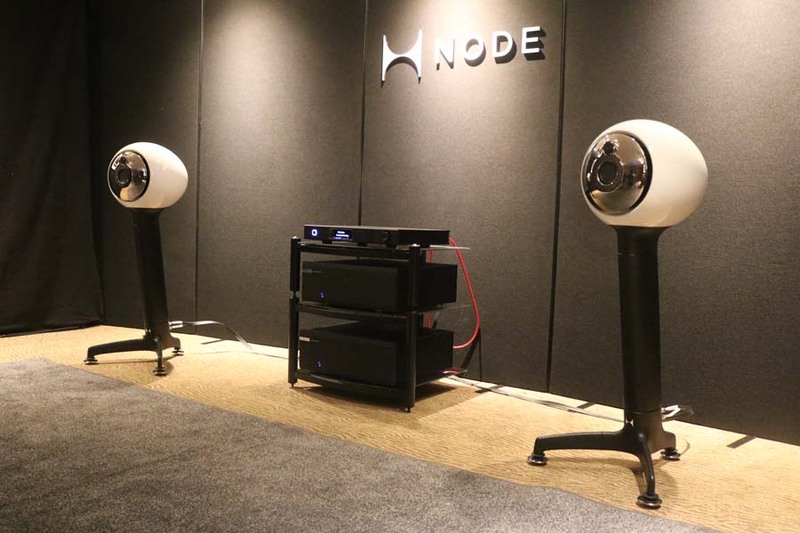 Node’s HYLIXA loudspeaker is the vision of British industrial designers Ashley May and David Evans, who set out to ‘reimagine what could be possible from a modern loudspeaker’. 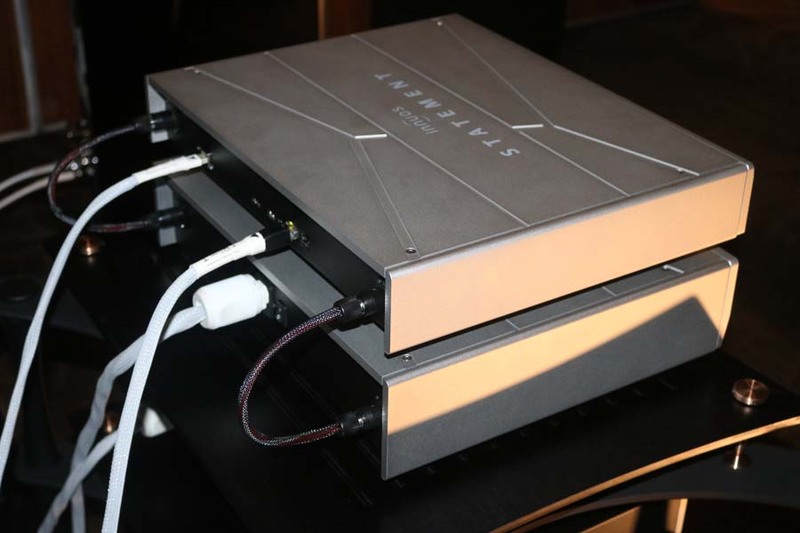 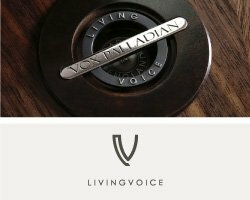 Ashley told us more about the new speakers: “HYLIXA masters vocal reproduction by replicating the sonic signature of a human head. 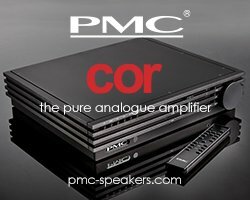 Its compact, curved cabinet lifts the veil of box-like colouration associated with traditional cabinets; whilst the wide-bandwidth BMR™ driver removes any crossover anomalies from the region where human hearing is most sensitive. 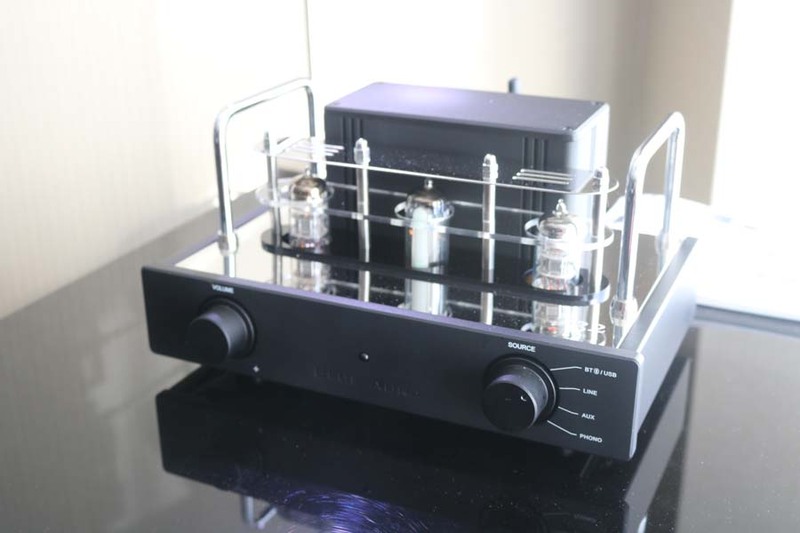 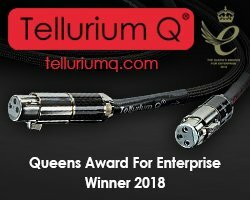 HYLIXA pioneers the industry’s first ‘Helical Transmission Line’ (HTL) – to deliver remarkable bass extension from a compact, passive design. 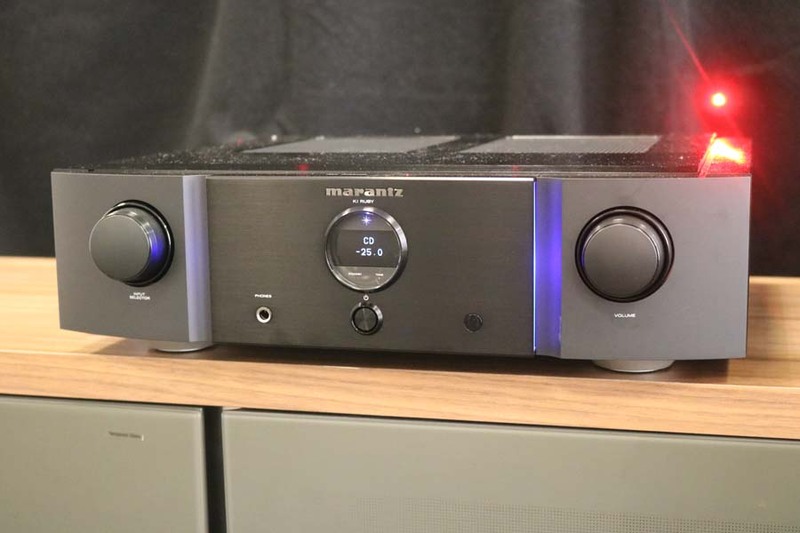 Driven by a rearward firing internal woofer, the low-impedance orbital path exits concentrically around the baffle; maintaining a wide-bandwidth point-source output, without ‘smearing’ in the time domain. 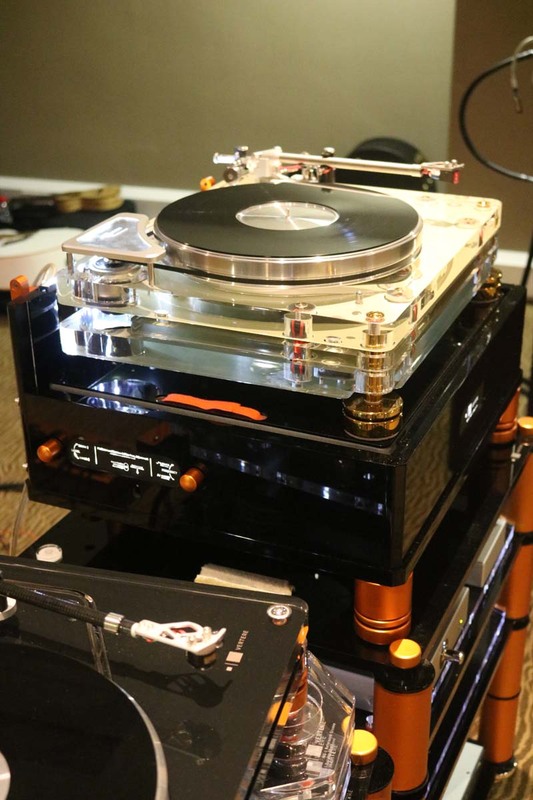 HYLIXA’s ability to resolve subtle harmonics makes instruments sound startlingly lifelike. 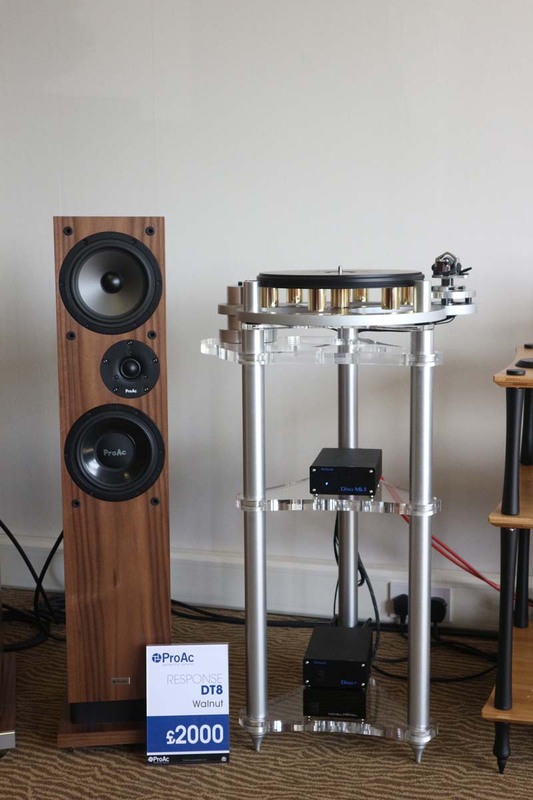 Fully optimised using advanced computer simulations, HYLIXA’s cabinet is devoid of any flat surfaces, is radially braced by the internal HTL and features a constantly changing wall section, to prevent the build-up of standing wave cabinet resonance”. 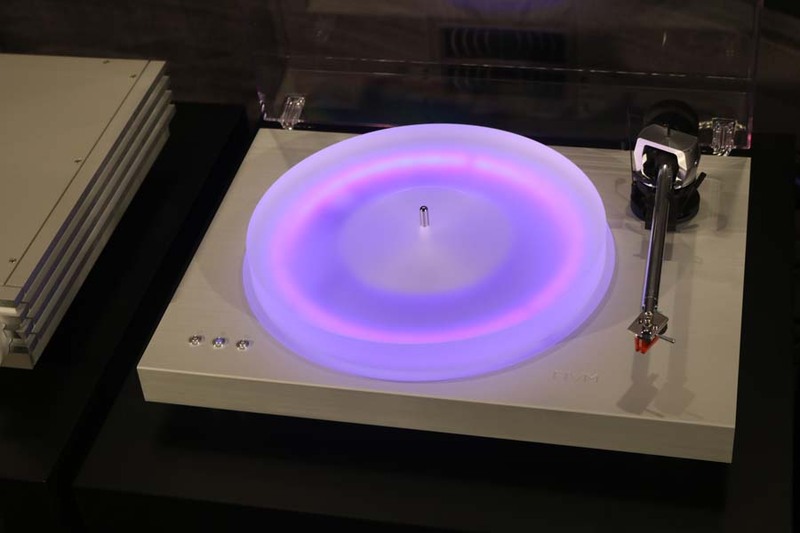 Each cabinet is systematically fused from particles of glass and nylon by a computer-controlled laser, each 0.2mm layer at a time. 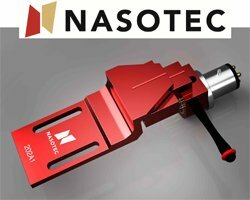 This allows the complex (patent pending) cabinet geometry to be grown as a single part. 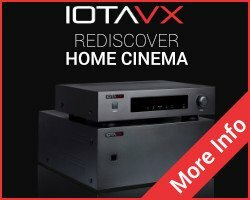 Prices start at £27,000. 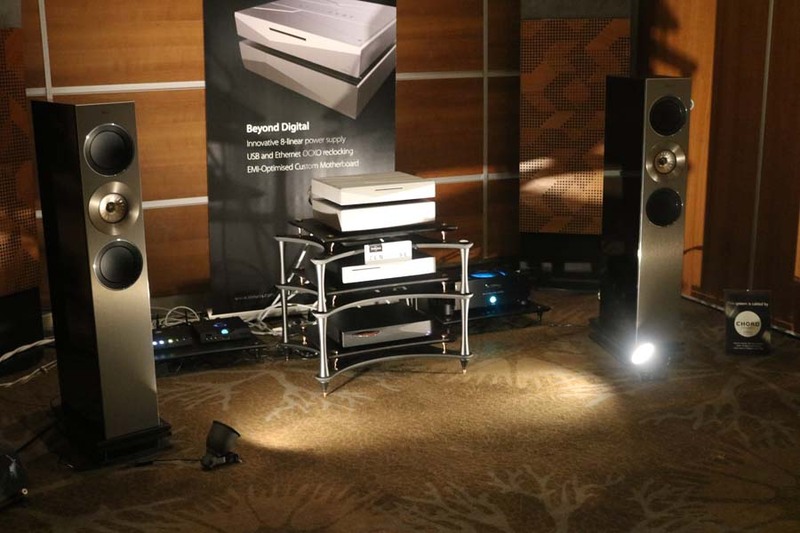 My thoughts on the sound, they were playing Miles Davis’ Sketches Of Spain, were that it was incredibly fast and detailed with a very audiophile kind of sound. 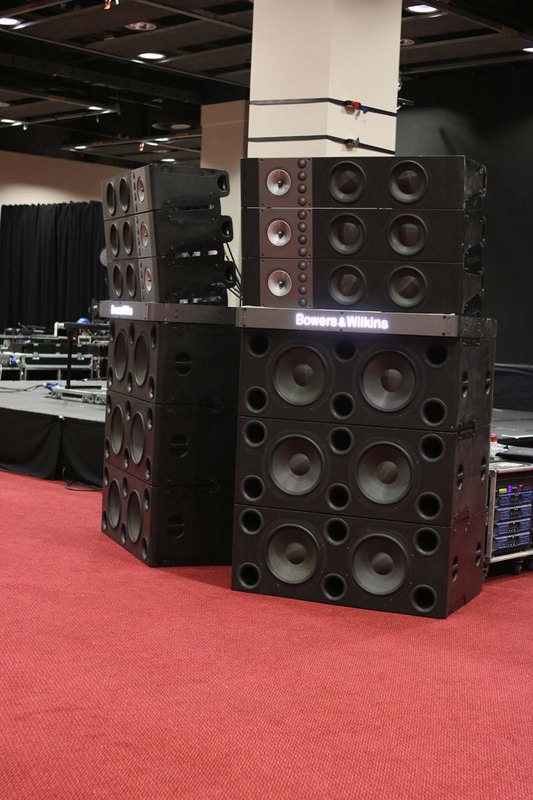 One visitor in the room commented on the speakers with a simple “The British have done it again”, which I thought pretty apt. 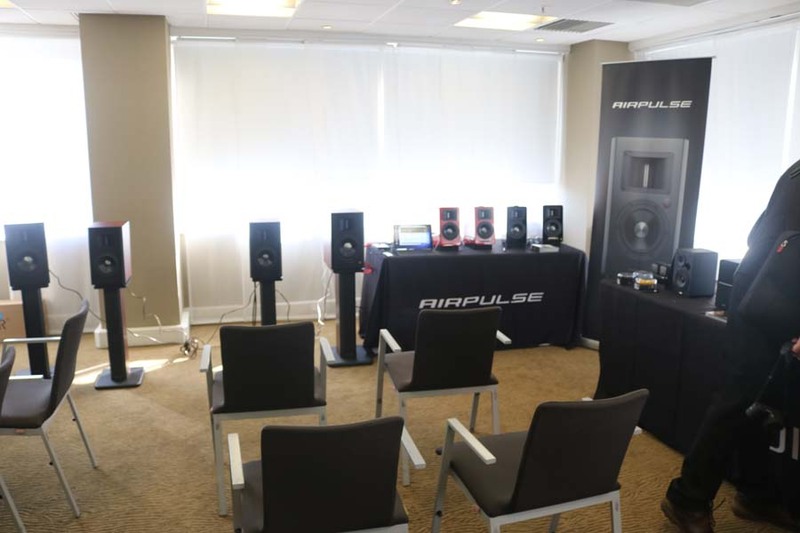 Bowers and Wilkins had a busy room but I was able to find a seat in the room powered by Chord electronics. 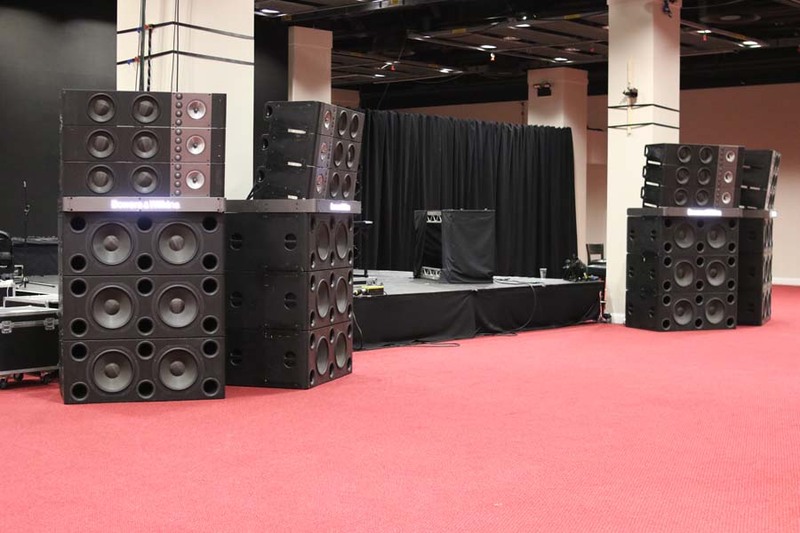 I loved this room and it was one of the sounds of the show for me, being very dynamic, tight and accurate. 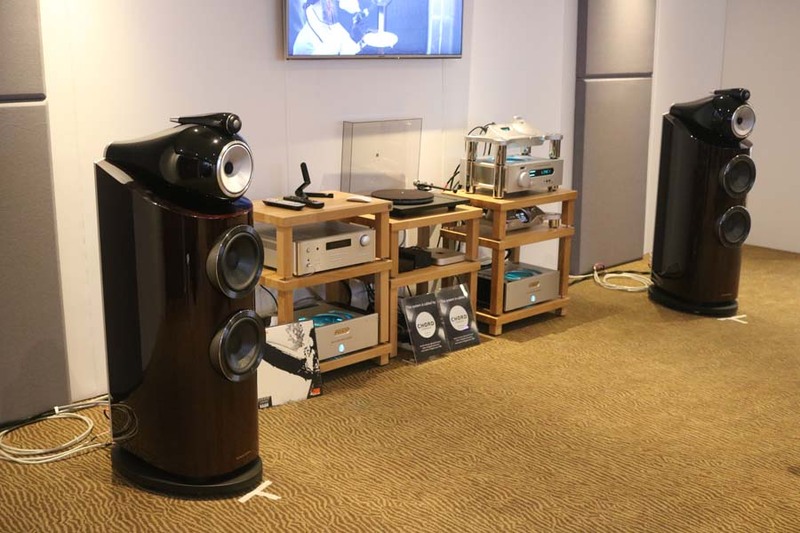 The speakers playing were the company’s new 802 in rosewood (£19.5K) and I sat through a couple of tunes despite time constraints and could have stopped a lot longer. 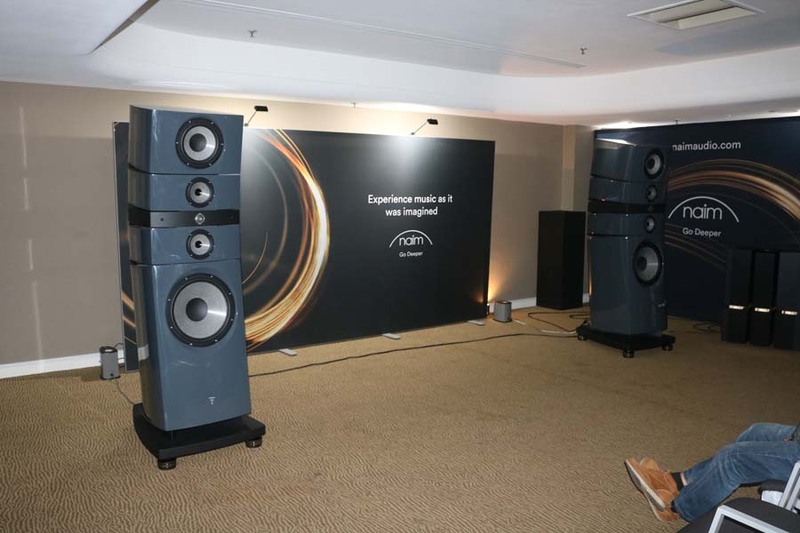 My thoughts were that whatever the style of music being played the speakers just delivered and didn’t seem to be bothered about the room. 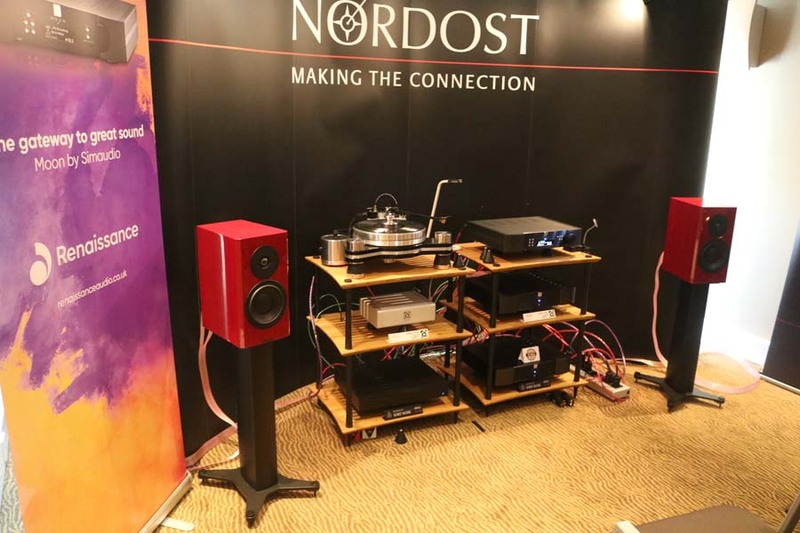 Read Linette’s Bird’s Eye View of The festival Of Sound here and the second show report from Stuart here. 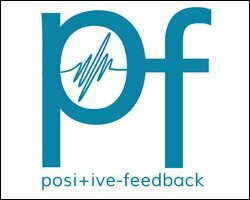 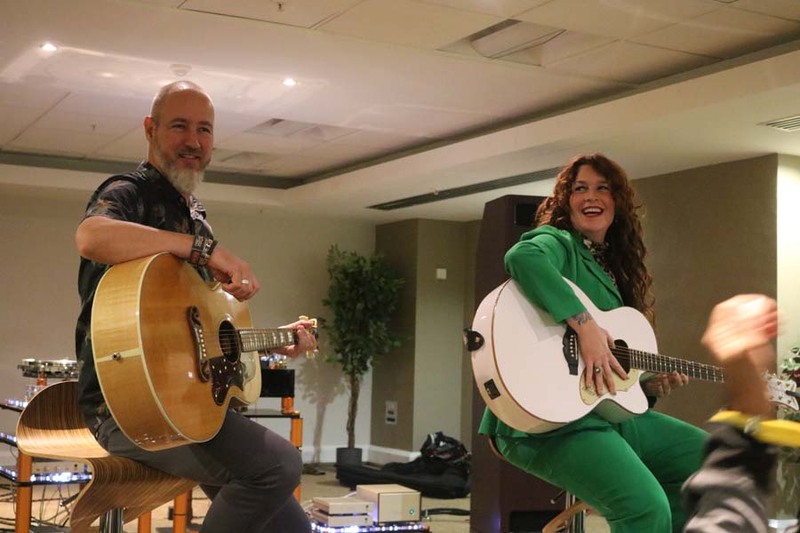 Festival Of Sound 2018 Update – Beth Nielsen Chapman, Ken Ishiwata And More! 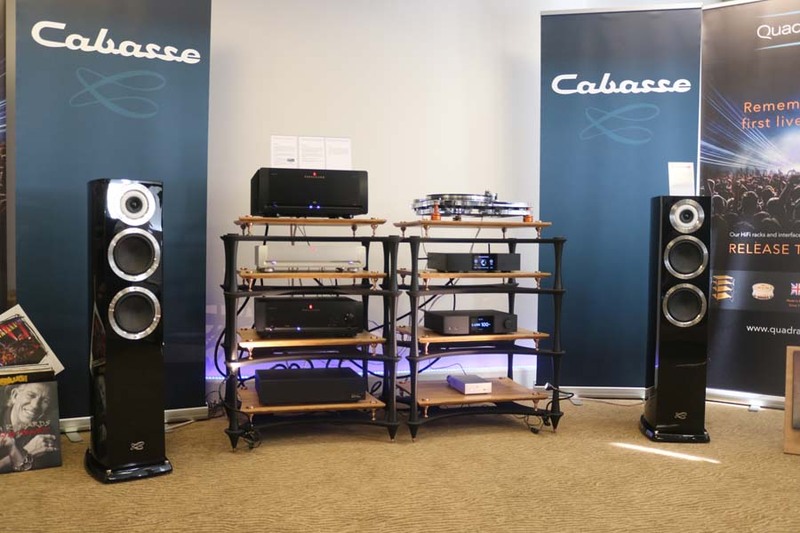 Festival Of Sound 2018 – Even More Events And Exhibitors Festival Of Sound 2018 – Cable And Accessories Exhibitors Festival Of Sound 2018 – Just One Week To Go!